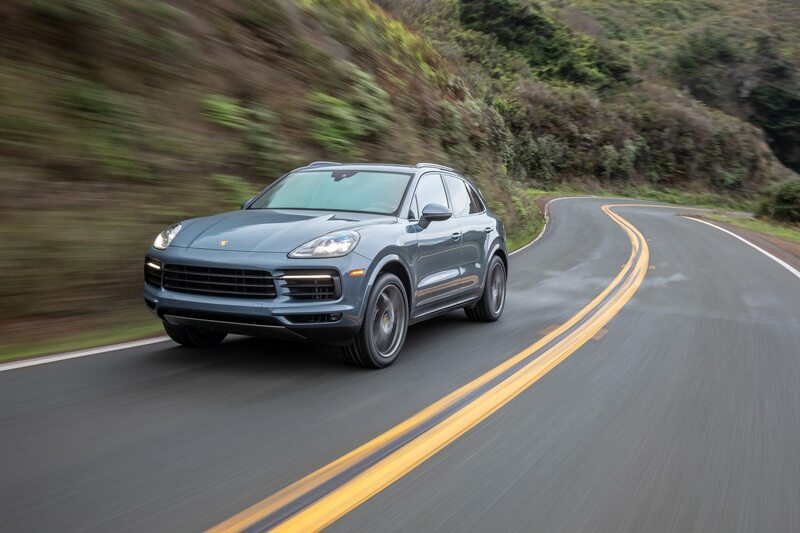 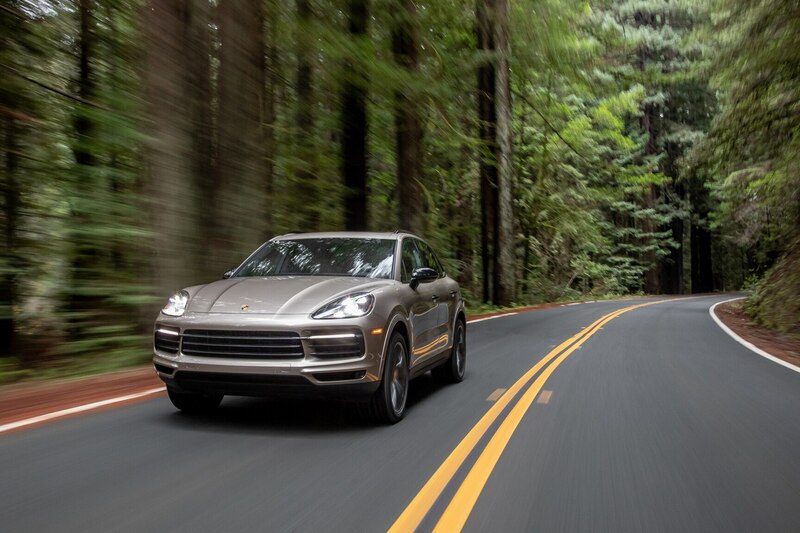 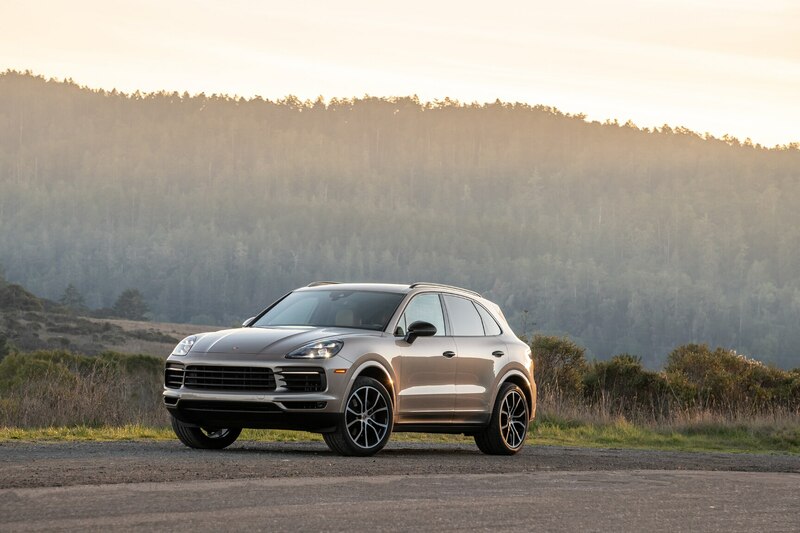 NAPA VALLEY, California—The backstory of Porsche’s hugely profitable SUV totem is familiar: Back in 2003, the Cayenne was met with a maelstrom of skepticism from purists who couldn’t fathom that such a philosophical break would eventually provide the financial security necessary to continue producing cars such as the 911 GT2 RS. 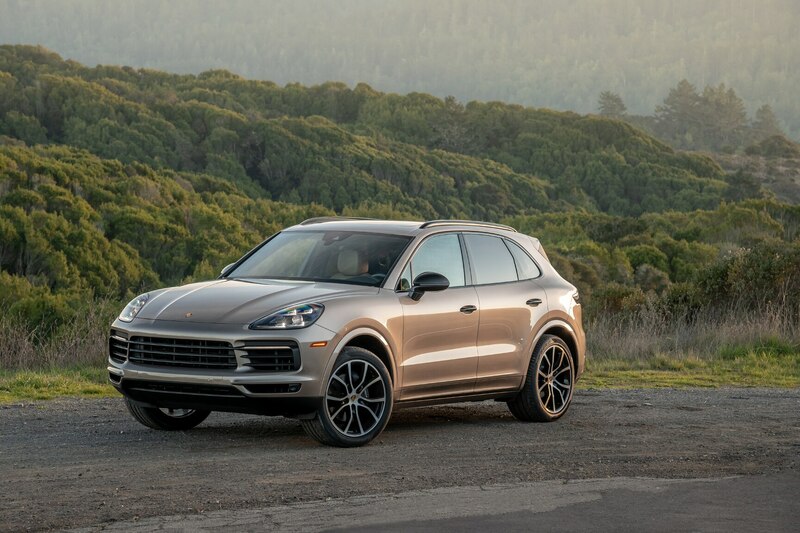 The intervening 15 years have seen remarkable paradigm shifts in the marketplace, with Porsche’s SUVs—yes, there are multiple ones now—outselling the iconic 911 by a factor of 3 to 1. 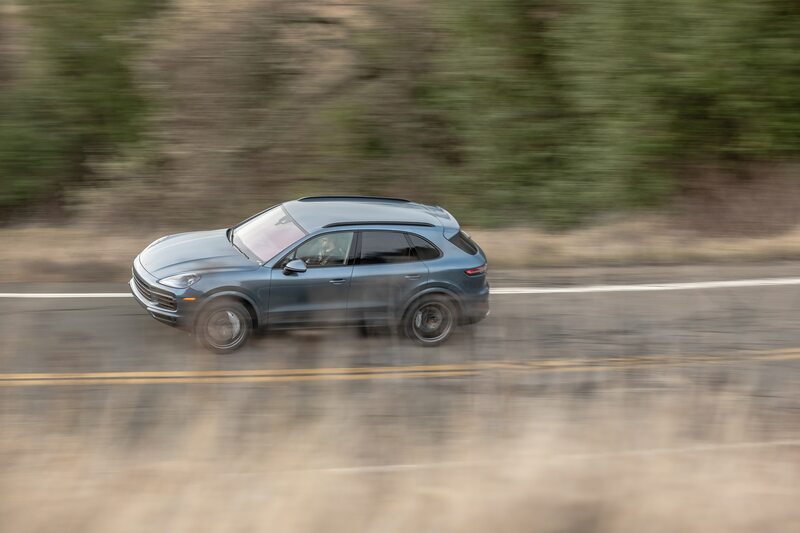 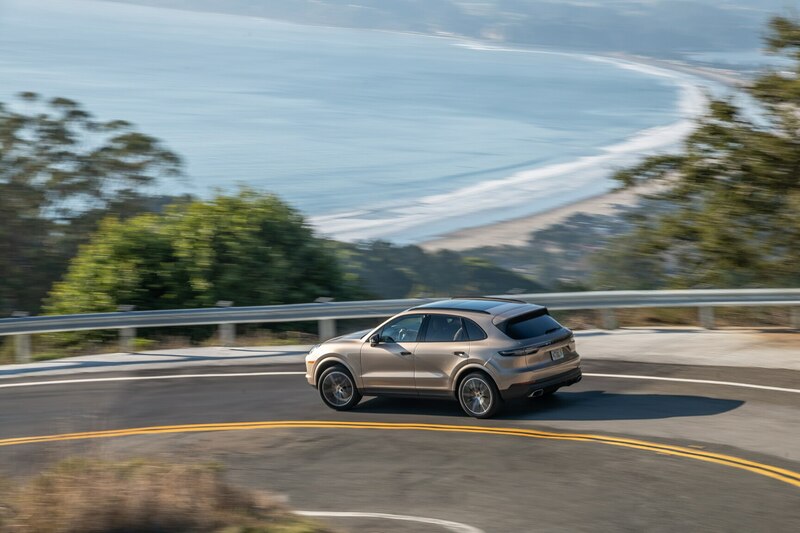 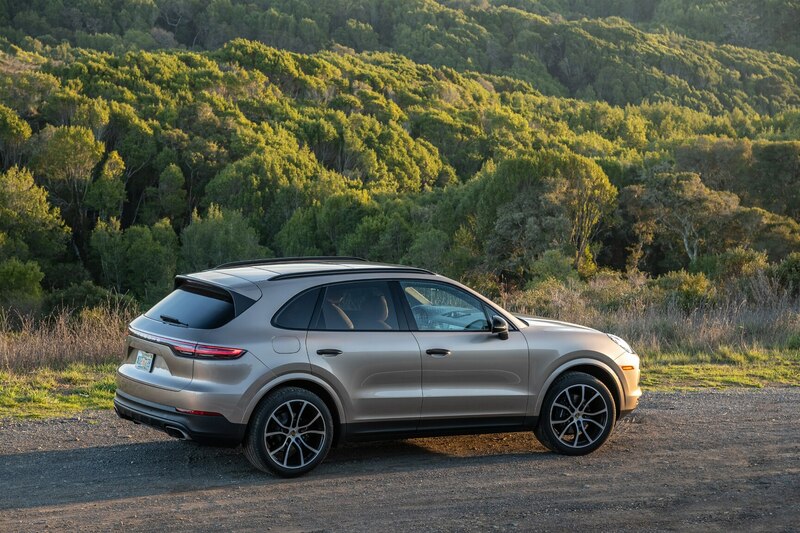 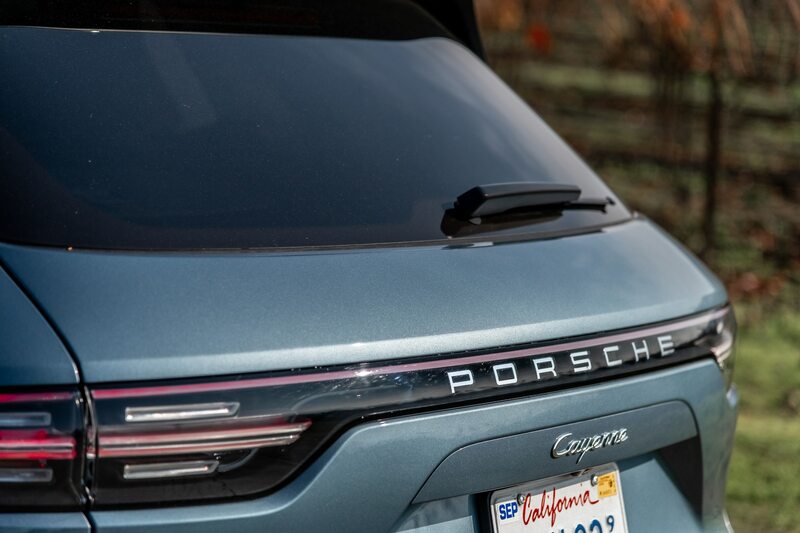 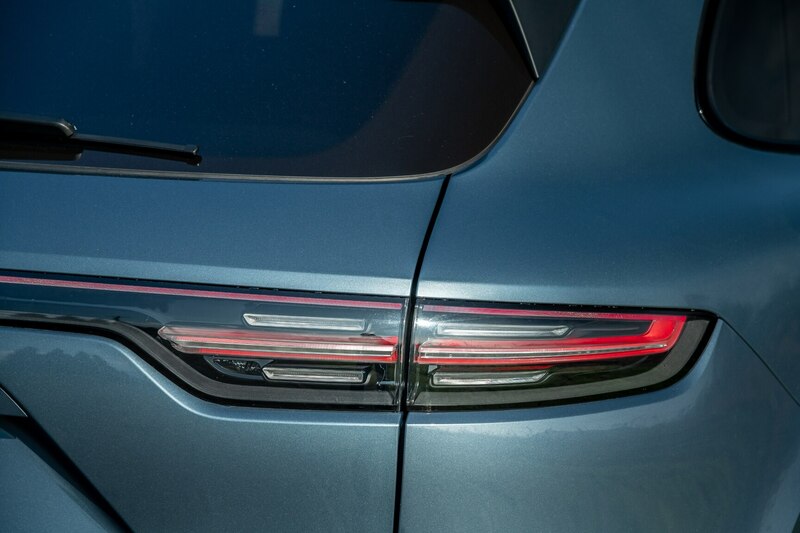 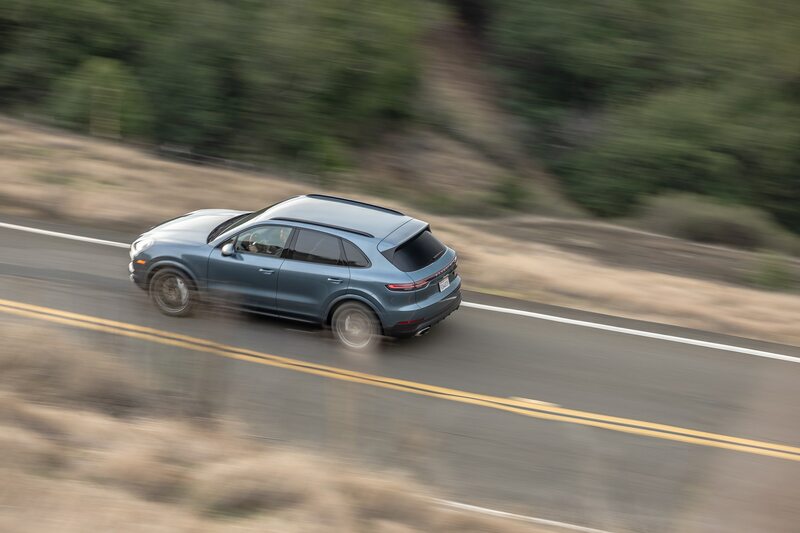 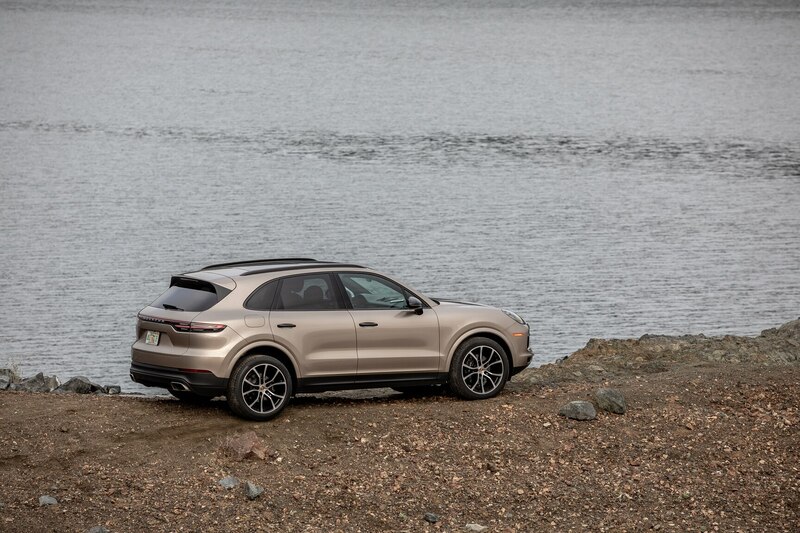 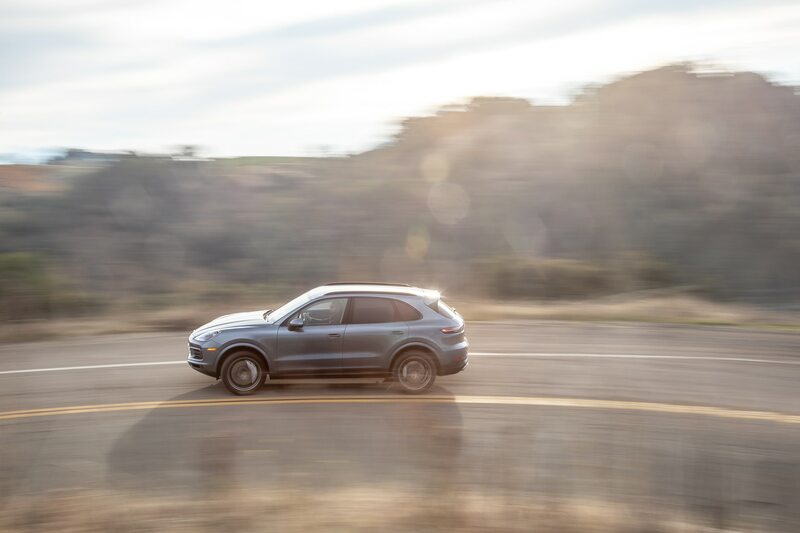 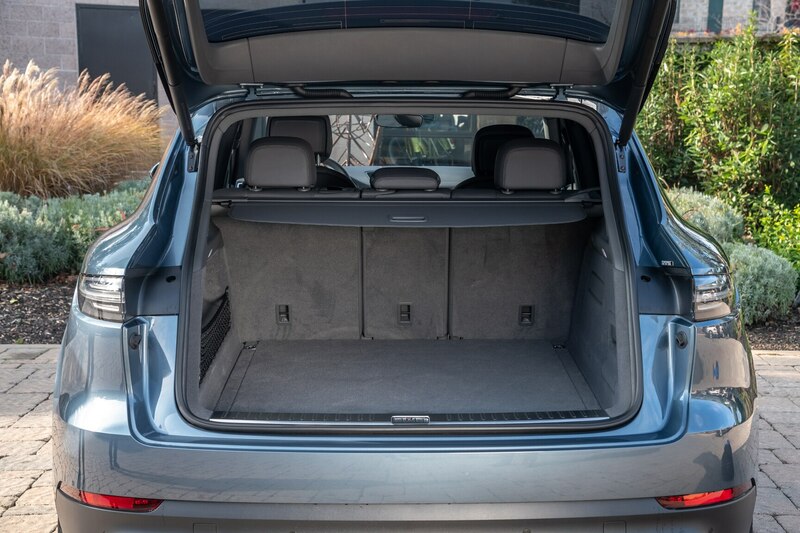 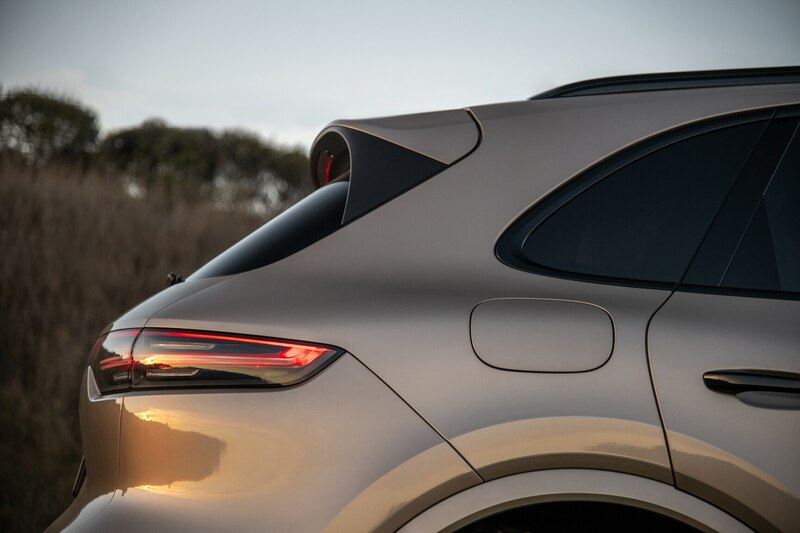 That said, it’s no wonder the third-gen 2019 Porsche Cayenne requires a trained eye to distinguish from its predecessor despite its “all-new” designation. 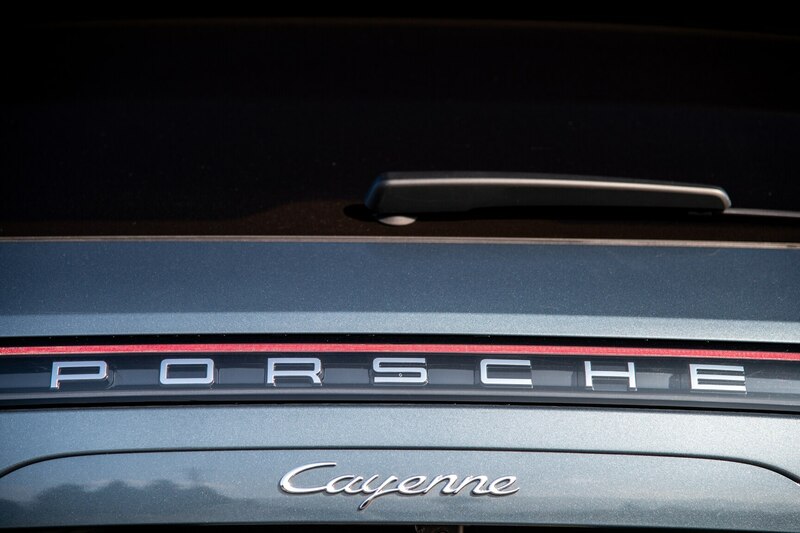 You can hardly blame Porsche for approaching its cash cow with the conservatism of a government-backed Treasury bond. 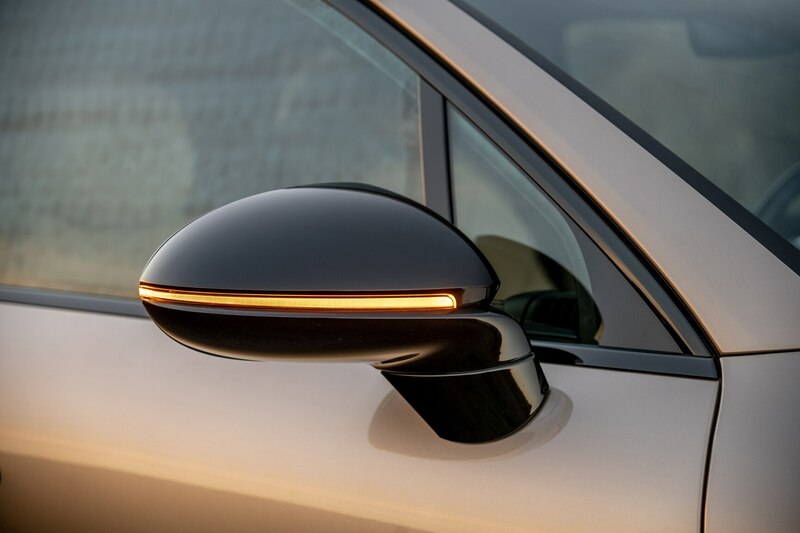 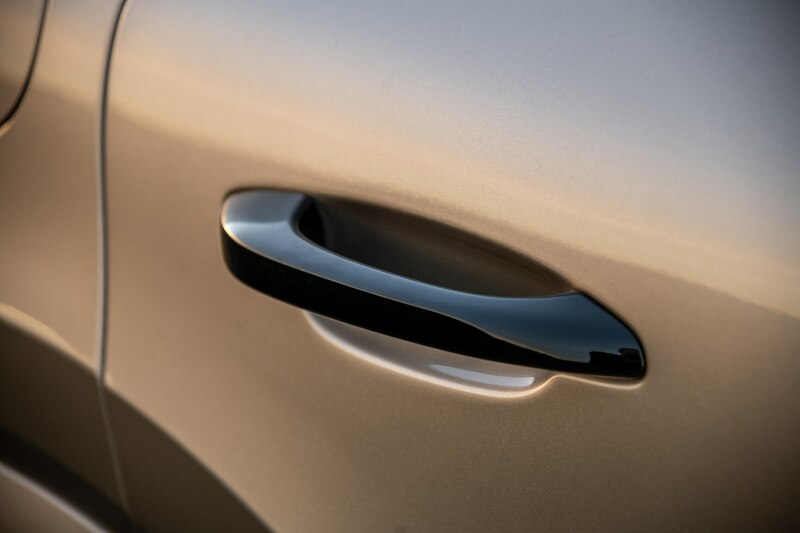 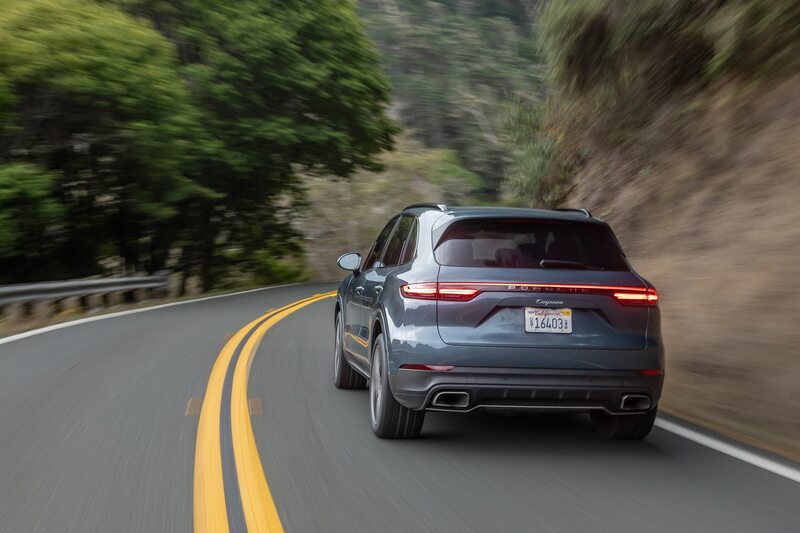 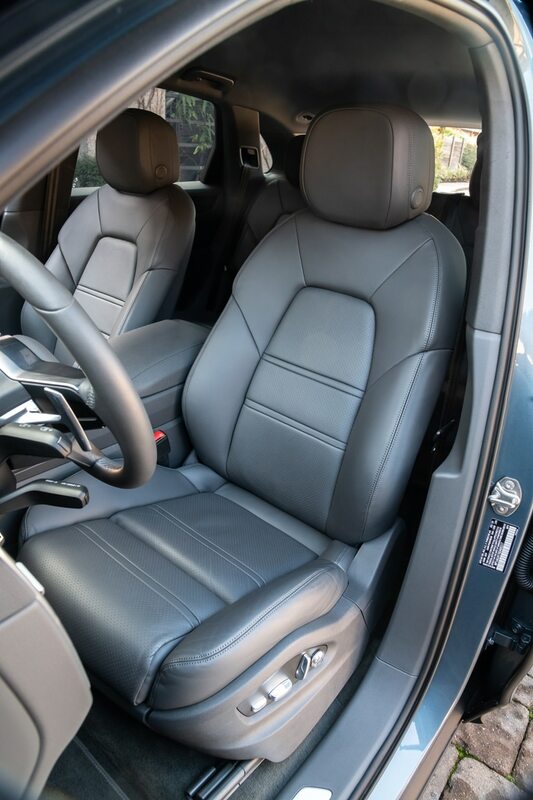 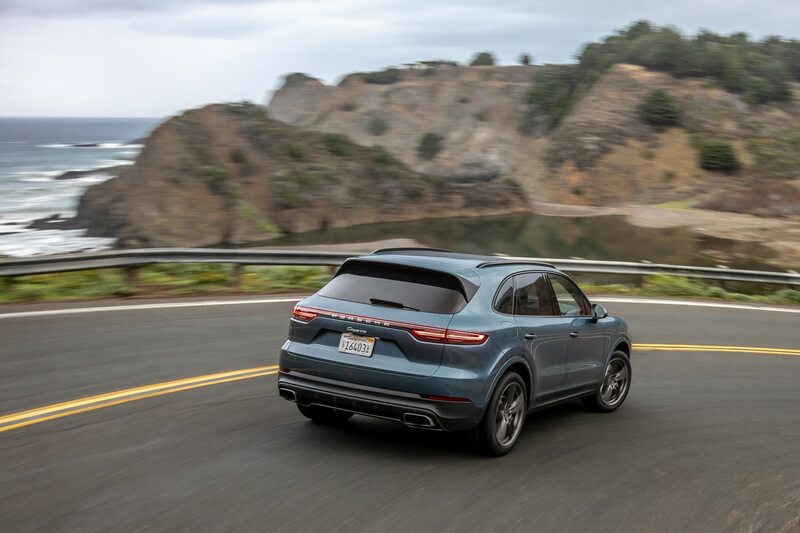 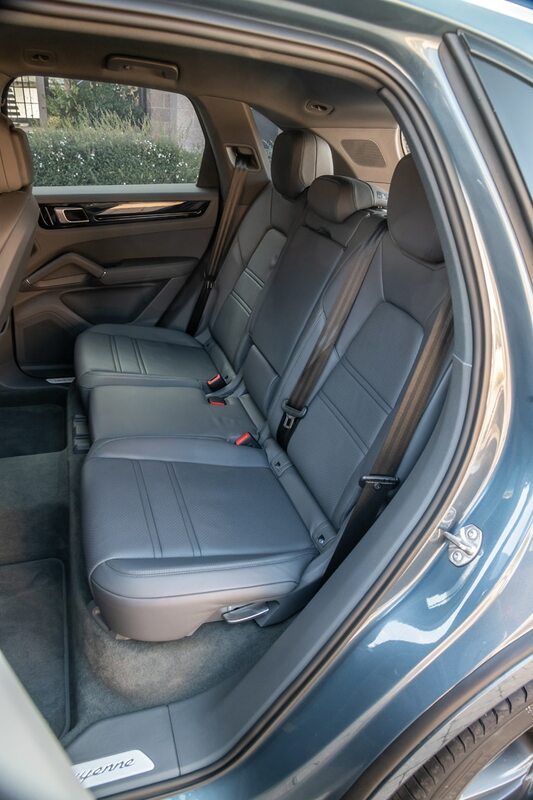 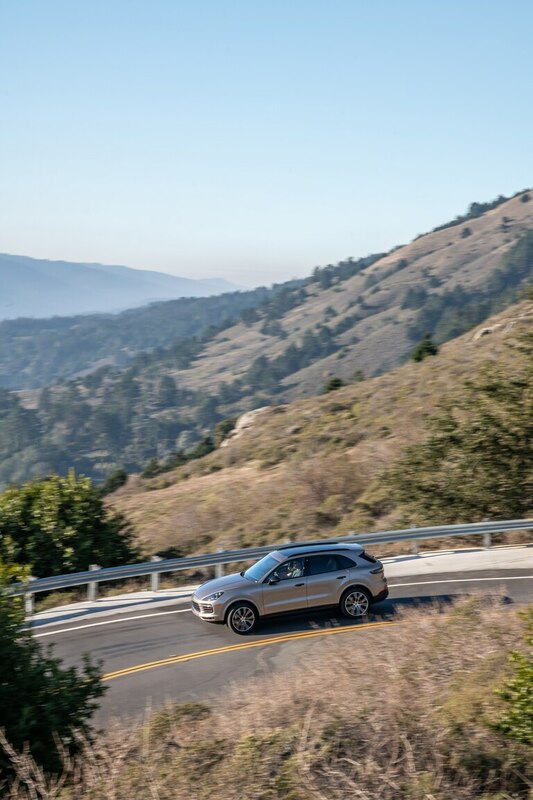 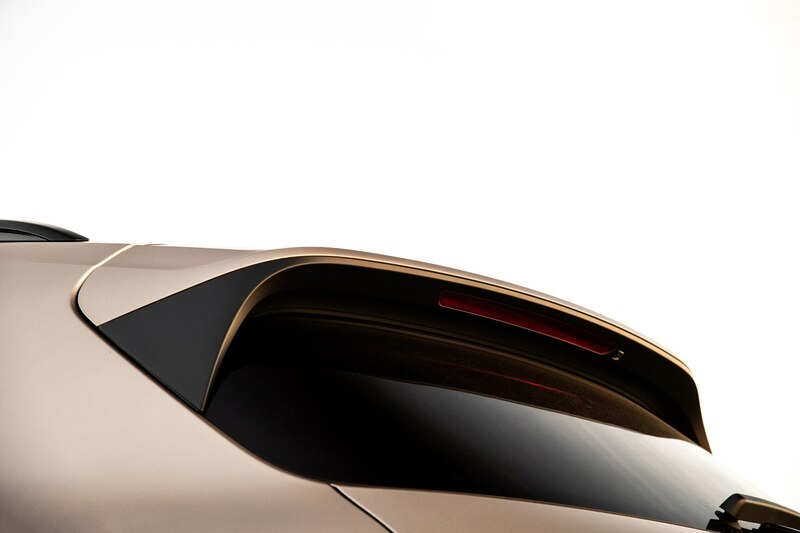 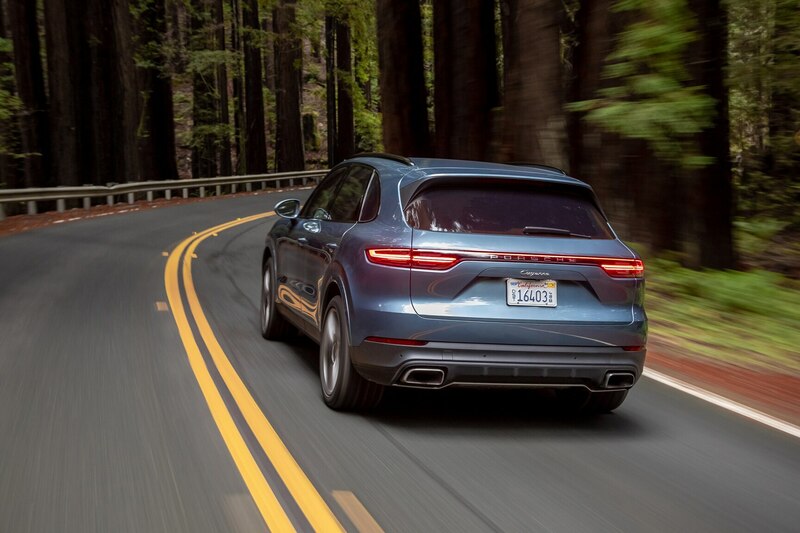 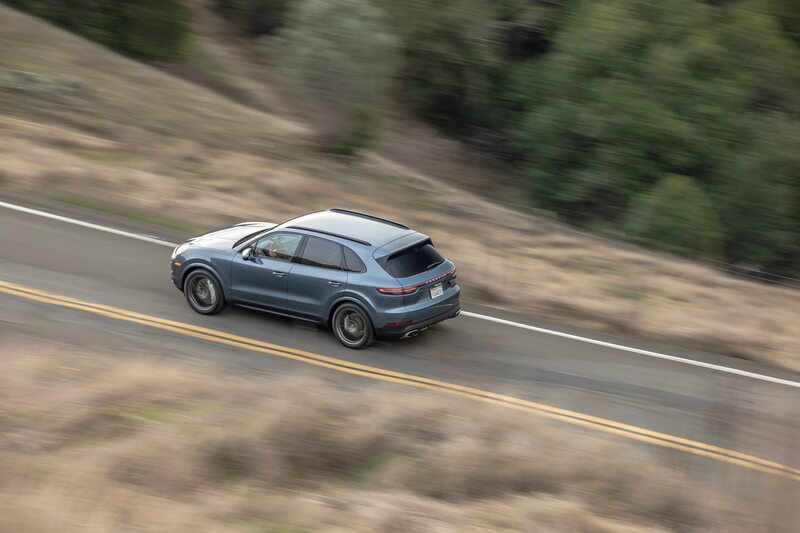 The 2019 model’s incrementally tweaked exterior includes slightly broadened haunches, newly staggered wheels, and a width that grows by 0.9 inch. 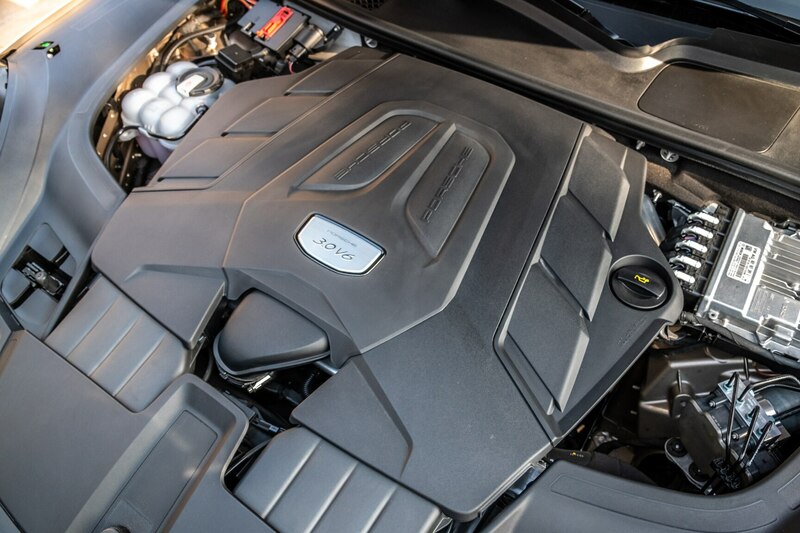 But under the skin lie fat-shedding tactics that include a body-in-white made from 47 percent aluminum, a new aluminum-intensive multilink front suspension in place of a steel control-arm setup, and a lithium-iron polymer starter battery that in and of itself trims 22 pounds. 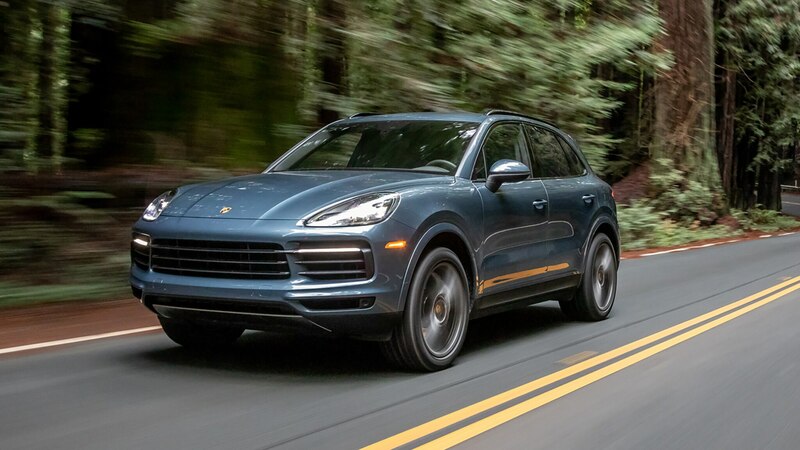 So despite a broader stance that says otherwise, the weight savings are real: 122 pounds versus the second-gen version, and a whopping 447 over the original Cayenne. 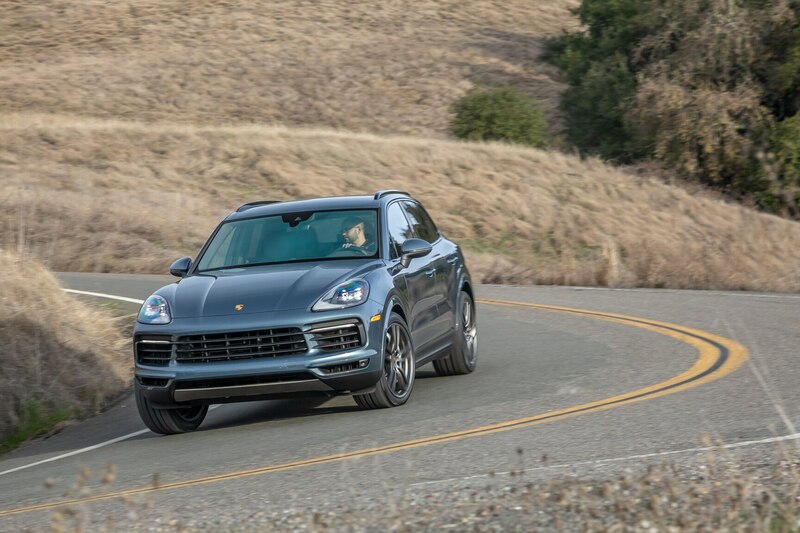 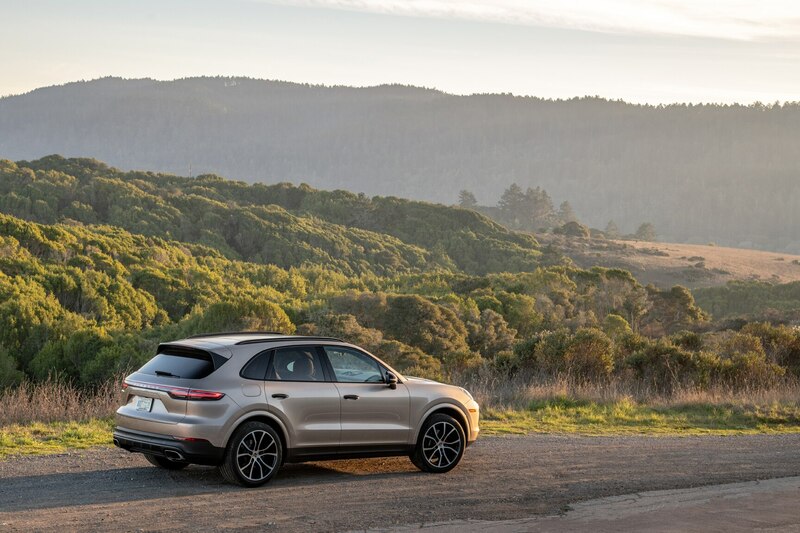 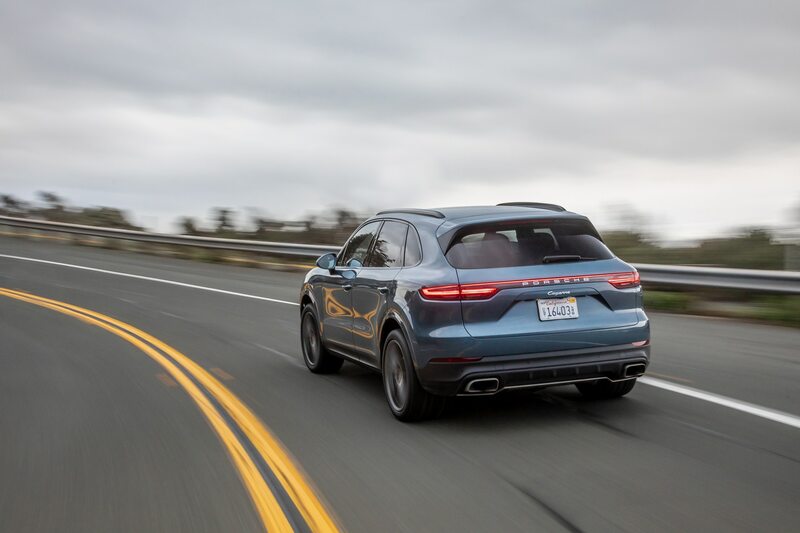 Our drive of the more workaday V-6 variant—we’ve previously driven the Turbo and E-Hybrid versions of the 2019 model—included an ambitiously twisty jaunt over some of Napa Valley’s most scenic stretches, a route likelier tackled by a low-slung sports car than a 4,377-pound sport utility. 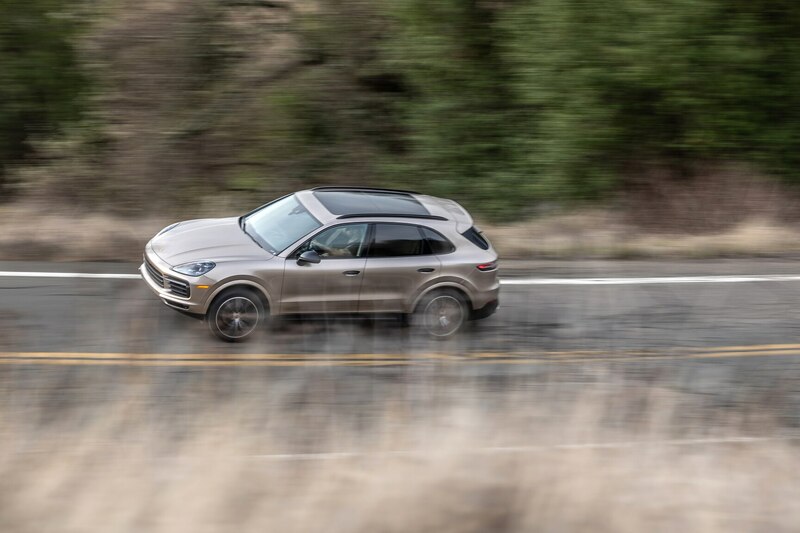 Regardless, one point became glaringly clear once we’d carved through the first few turns: The latest Cayenne is the sportiest yet, even in the base trim. 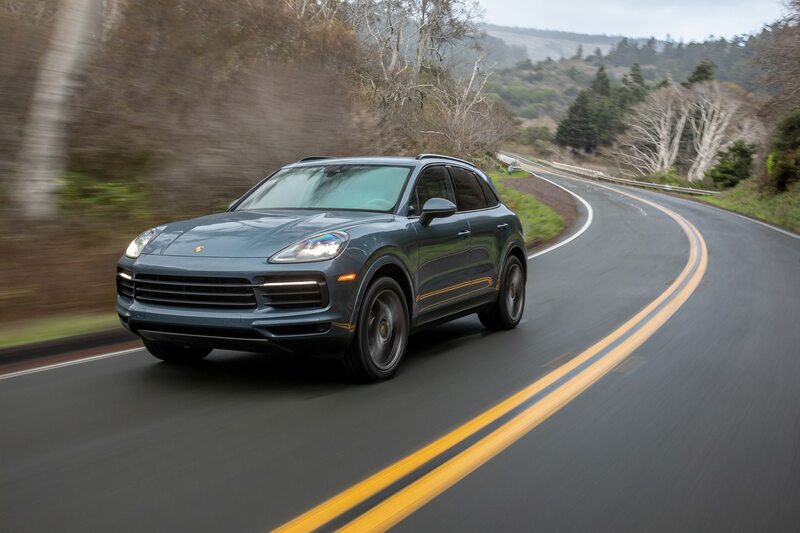 A large amount of credit goes to a new single-turbocharger 3.0-liter V-6 that replaces the naturally aspirated V-6 of previous iterations. 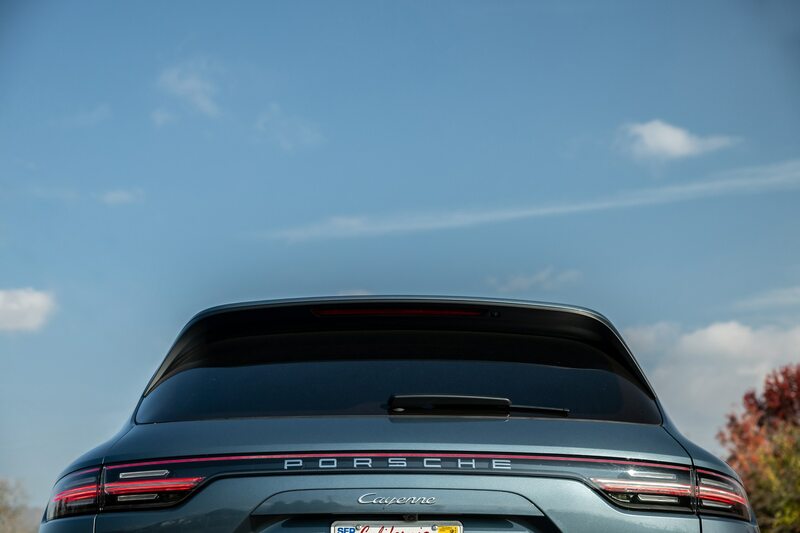 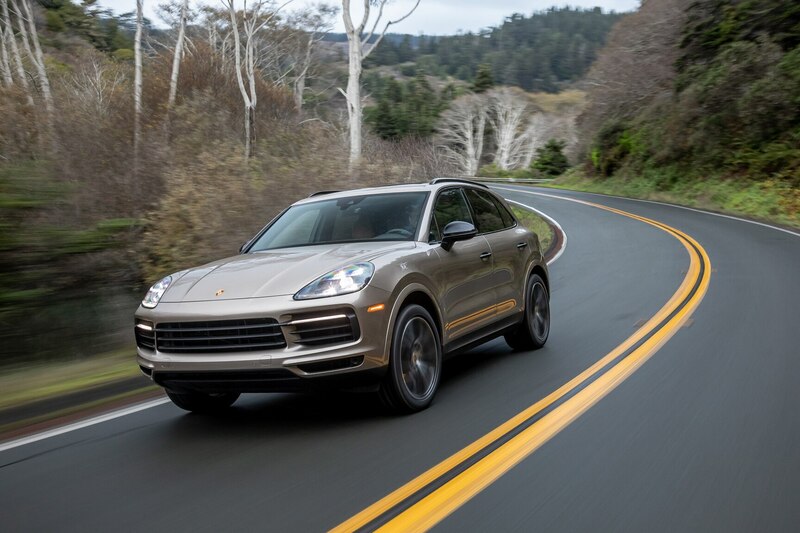 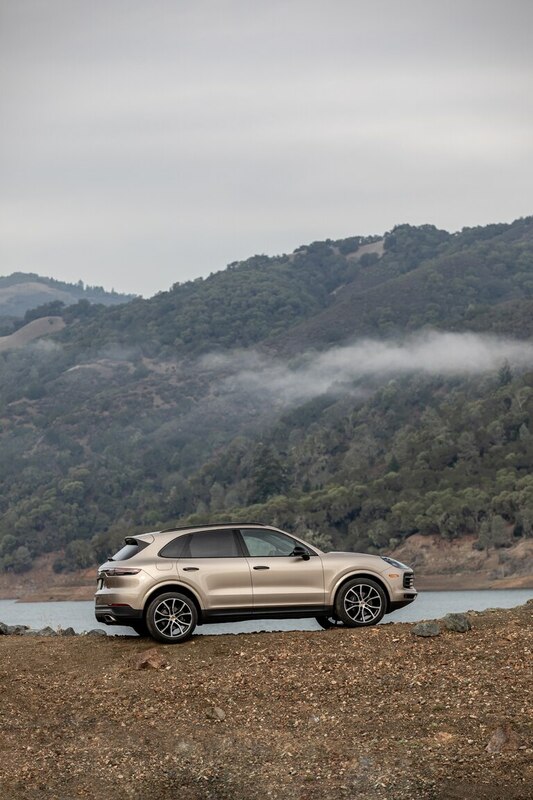 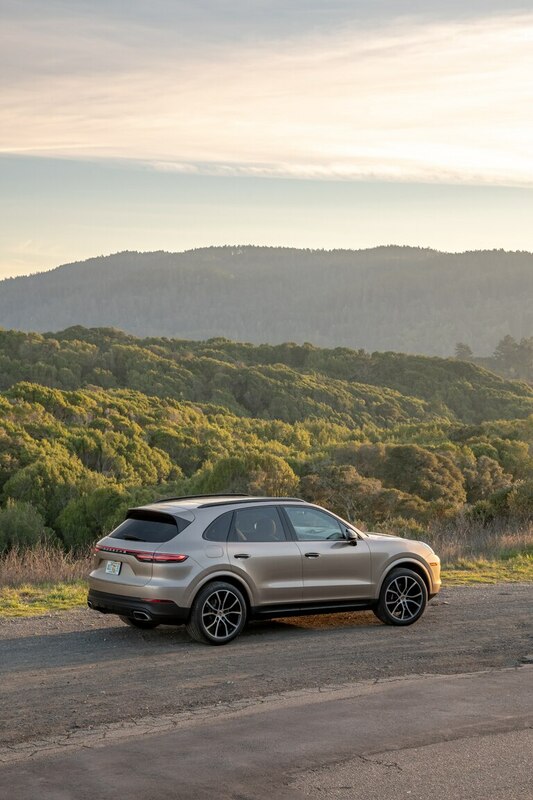 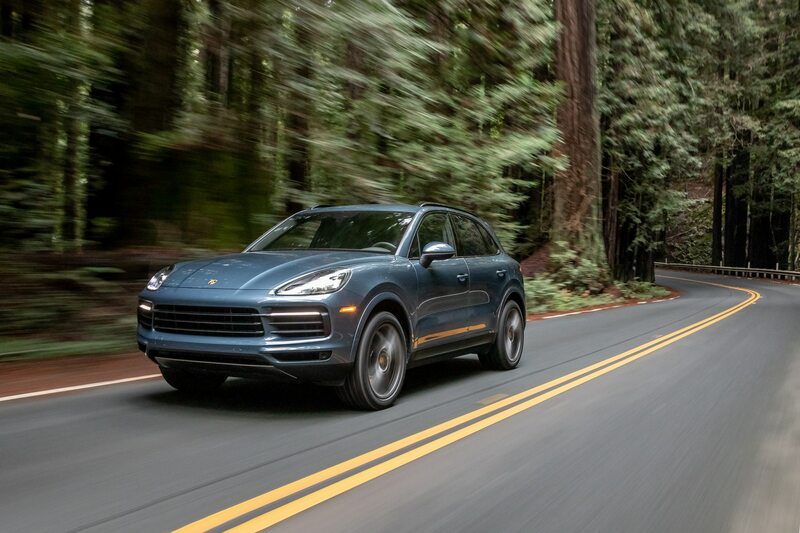 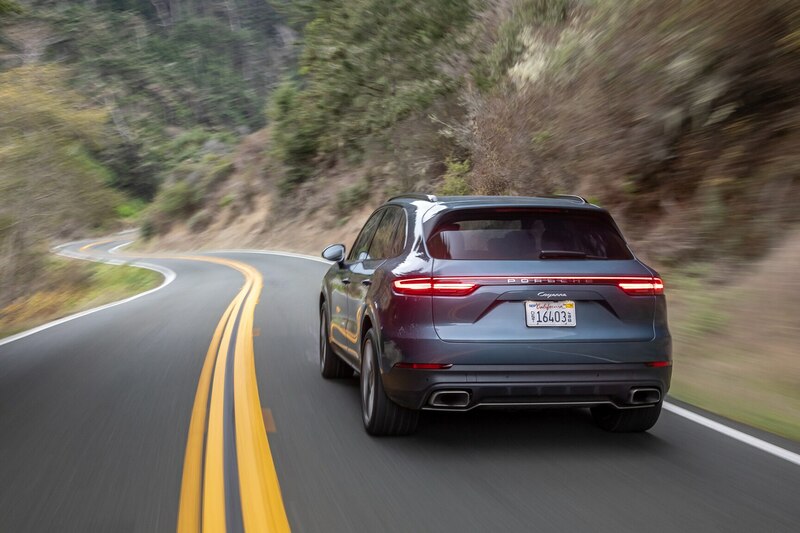 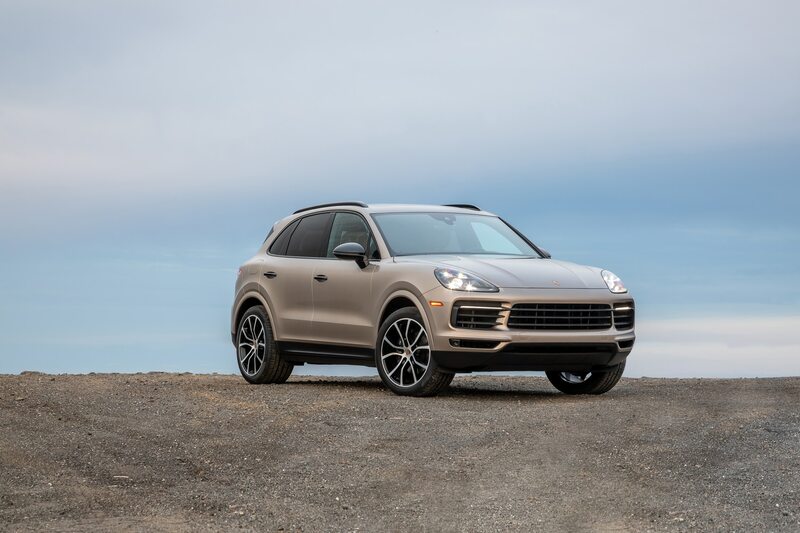 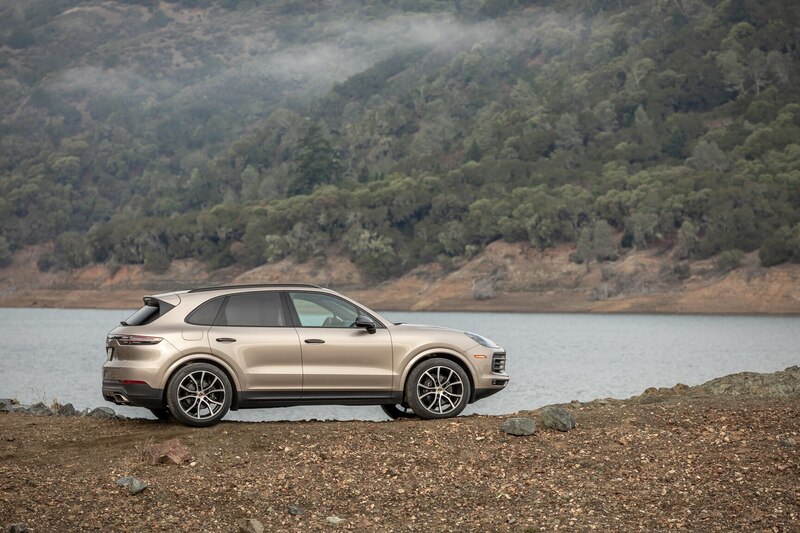 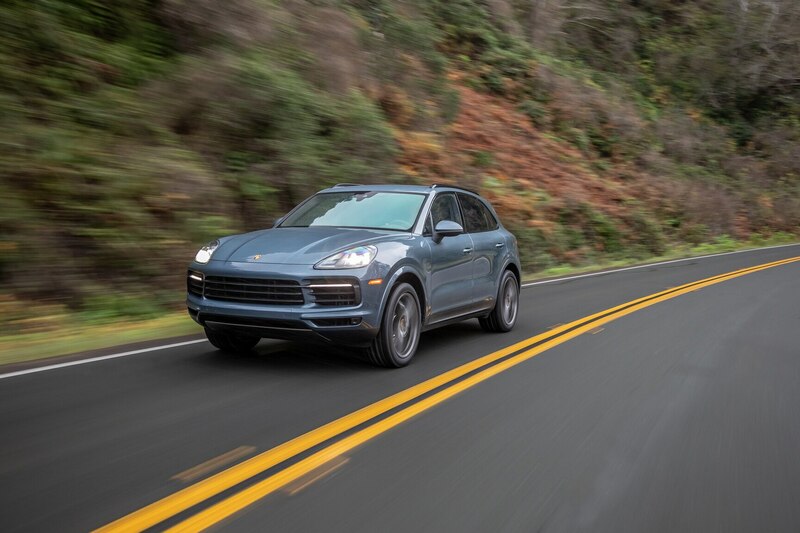 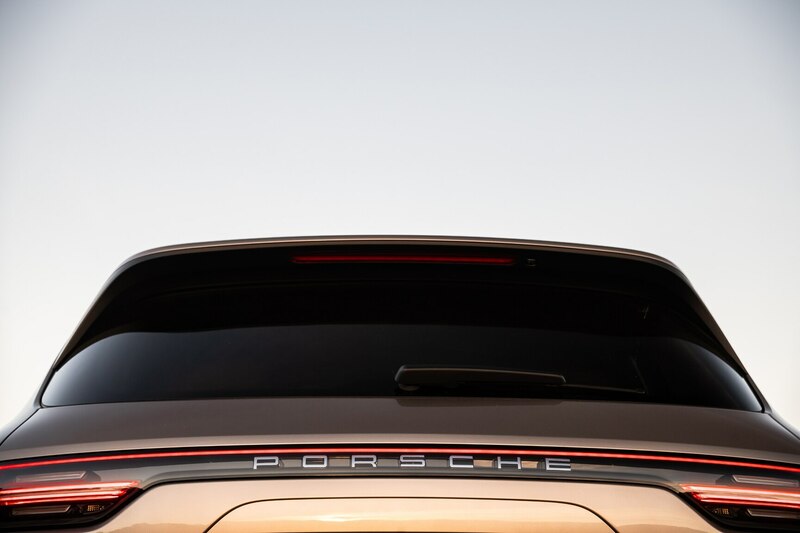 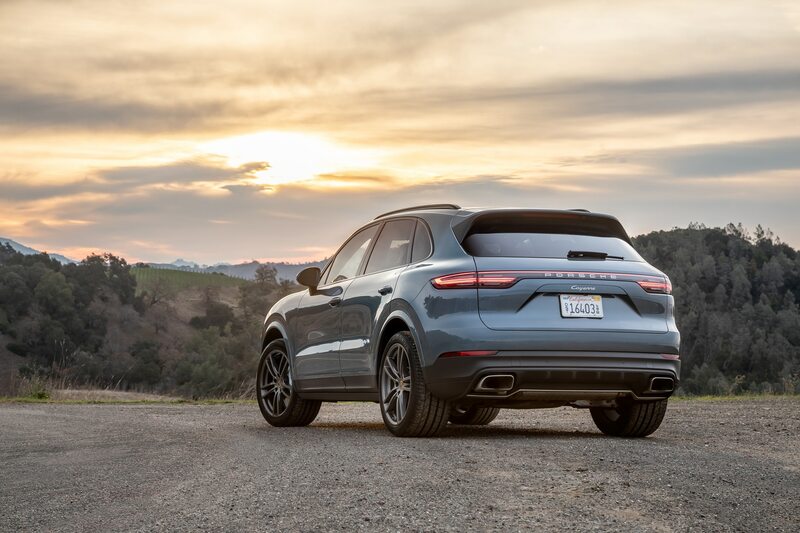 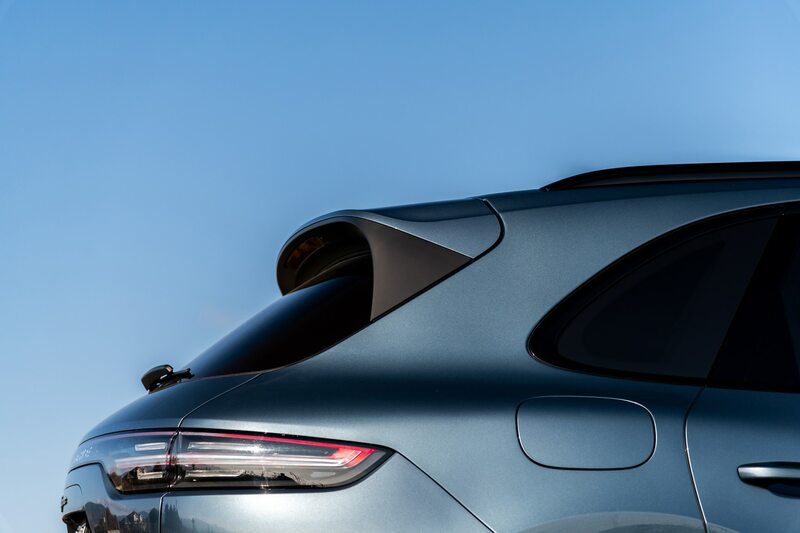 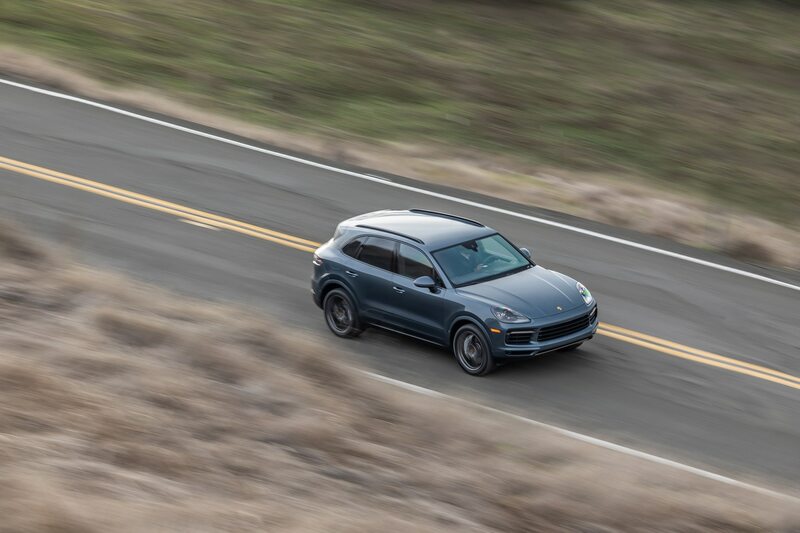 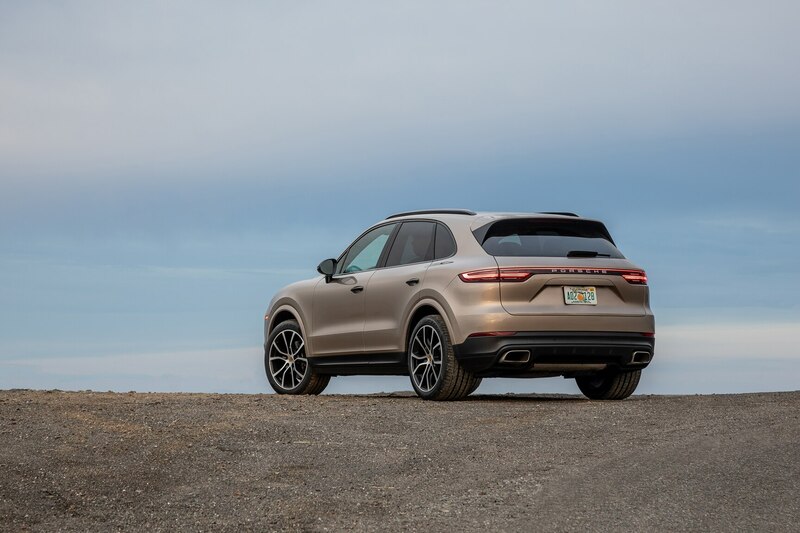 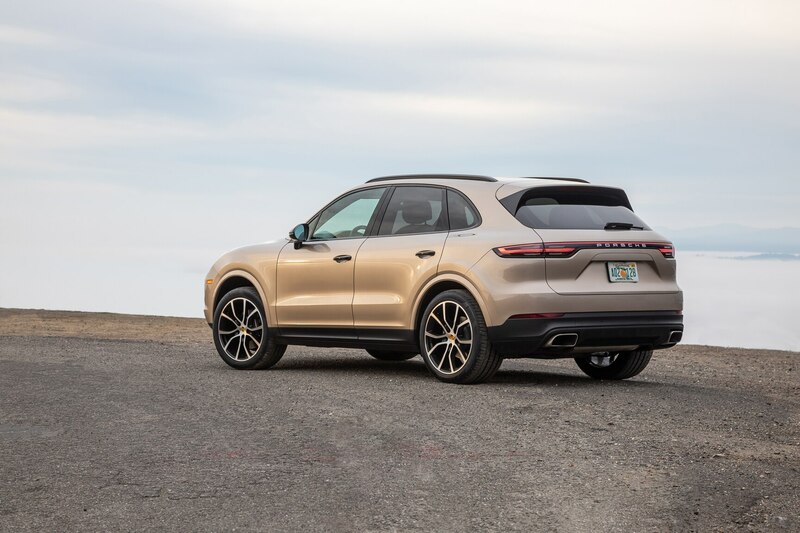 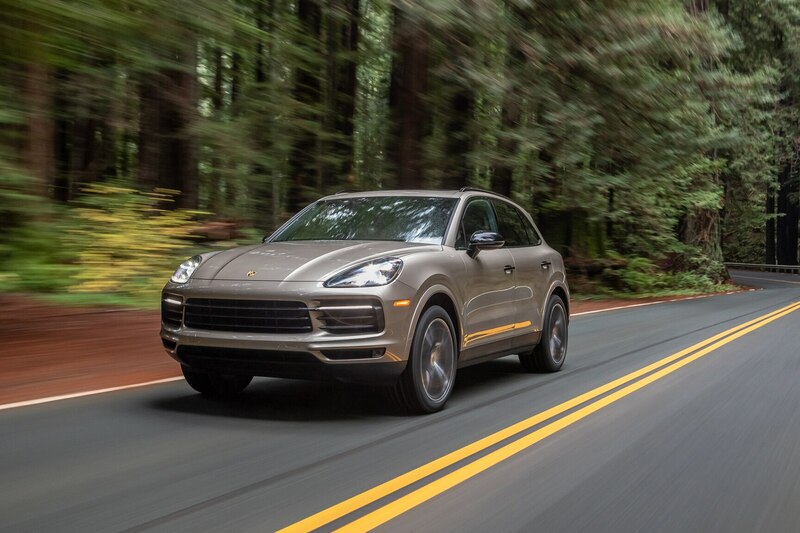 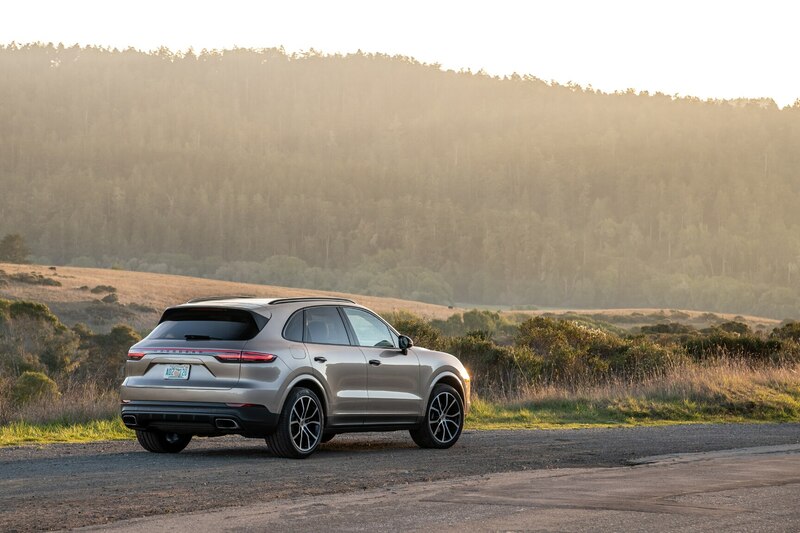 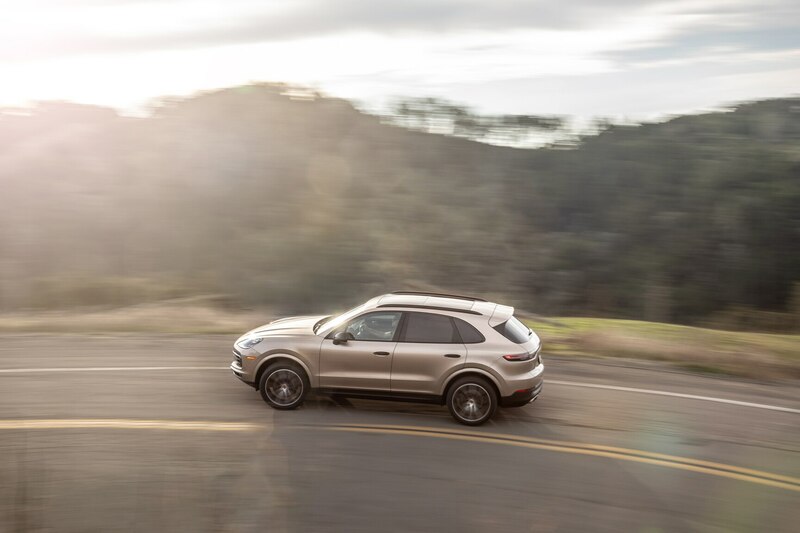 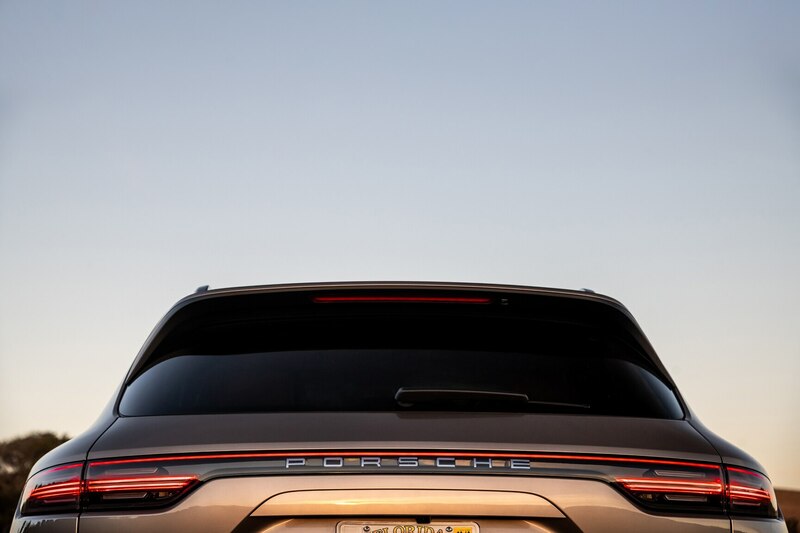 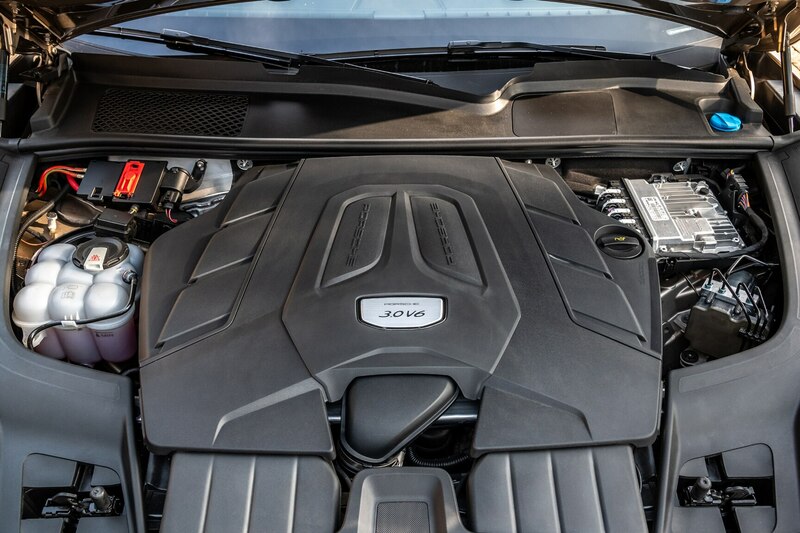 The mill produces 35 more horses and 37 additional lb-ft of torque, and is said to power the Cayenne to 60 mph in as little as 5.6 seconds—1.6 seconds quicker than its predecessor. 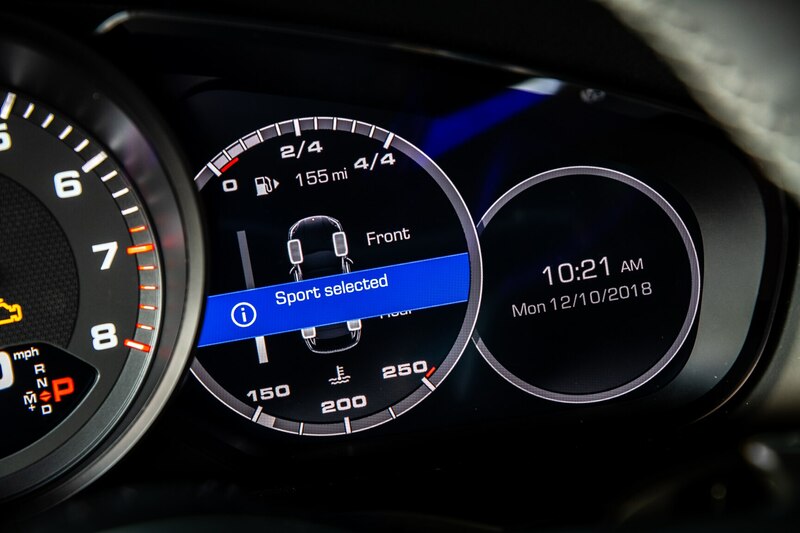 Although diehards might miss the auditory delights of the naturally aspirated engine, the overall experience is richer and acceleration is palpably more urgent, especially when the powertrain is set to Sport mode (or Sport+ when equipped with the Sport Chrono package). 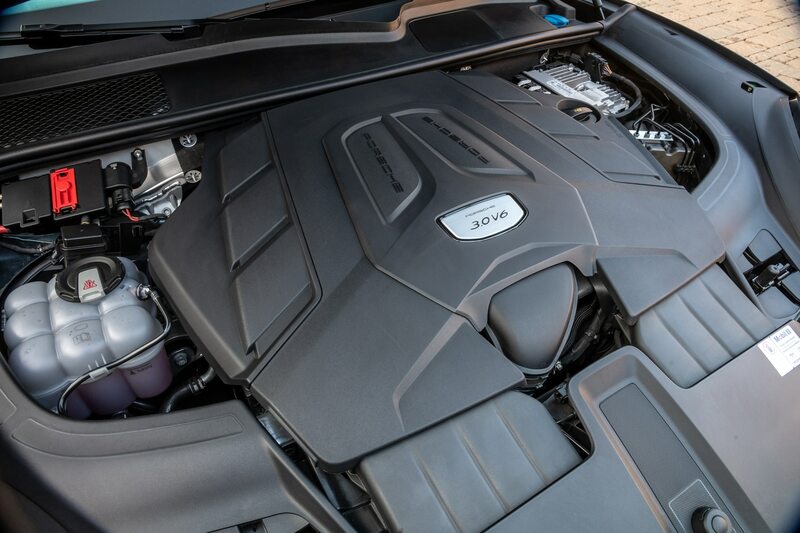 Power is directed to all four wheels via a new electronically controlled transfer case that sends up to 100 percent of torque to the front or rear axles, while the eight-speed Tiptronic S transmission uses a wider ratio spread that enables both quicker acceleration and more relaxed high-speed cruising, and the torque-converter gearbox is said to be better-suited for towing and off-road tasks than Porsche’s dual-clutch PDK transmission. 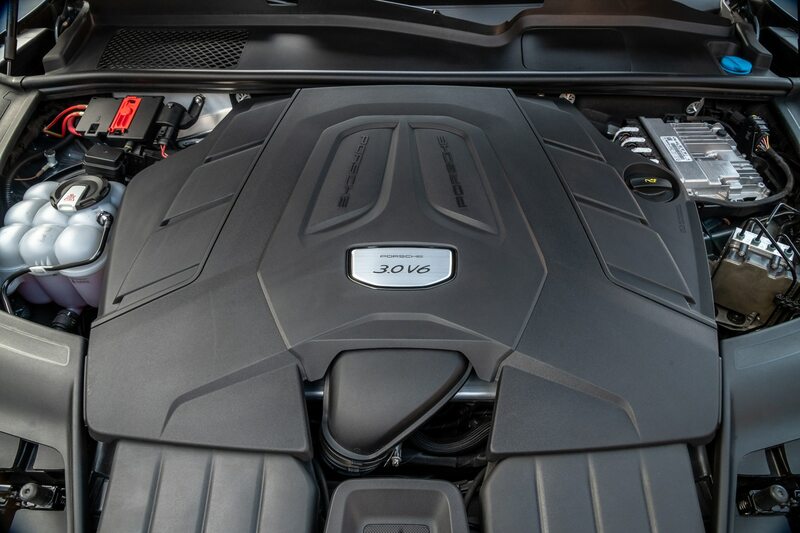 It’s a smooth and largely invisible partner for the V-6, allowing you to revel in the engine’s predictable linearity rather than worry about gear selection. 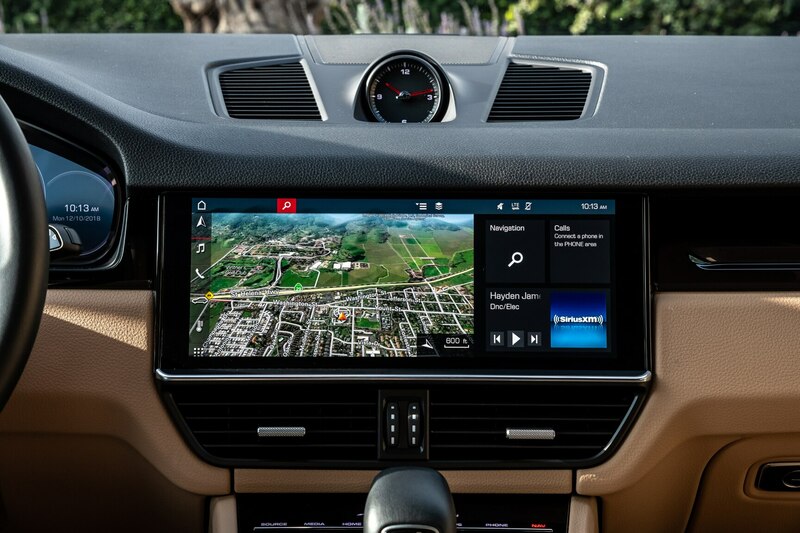 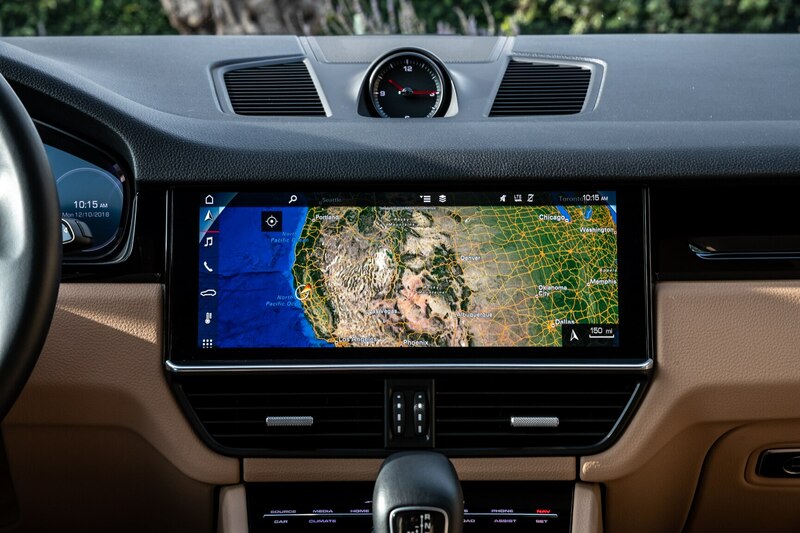 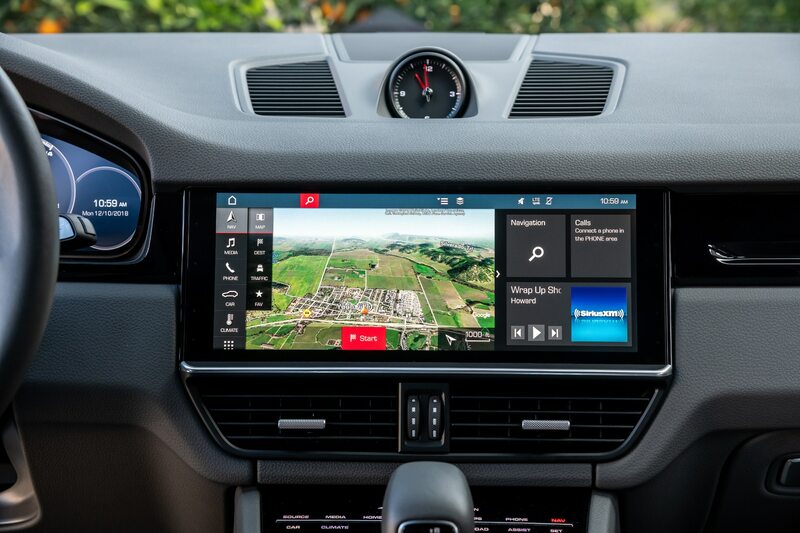 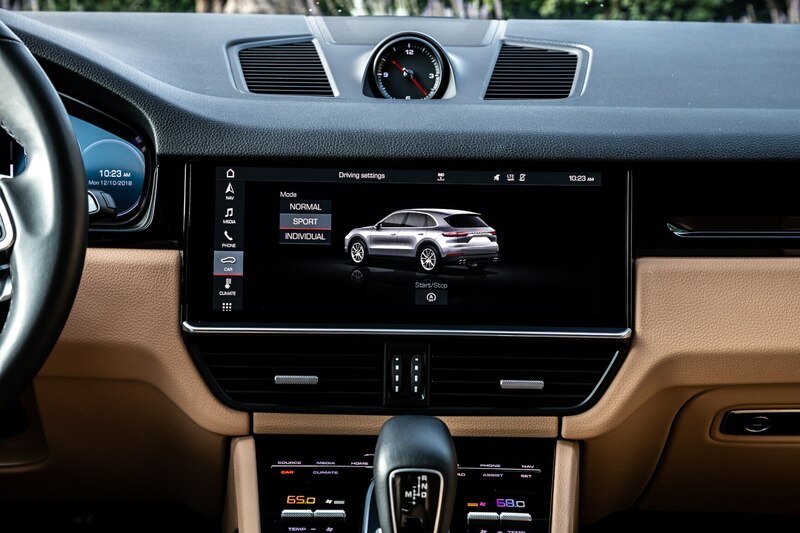 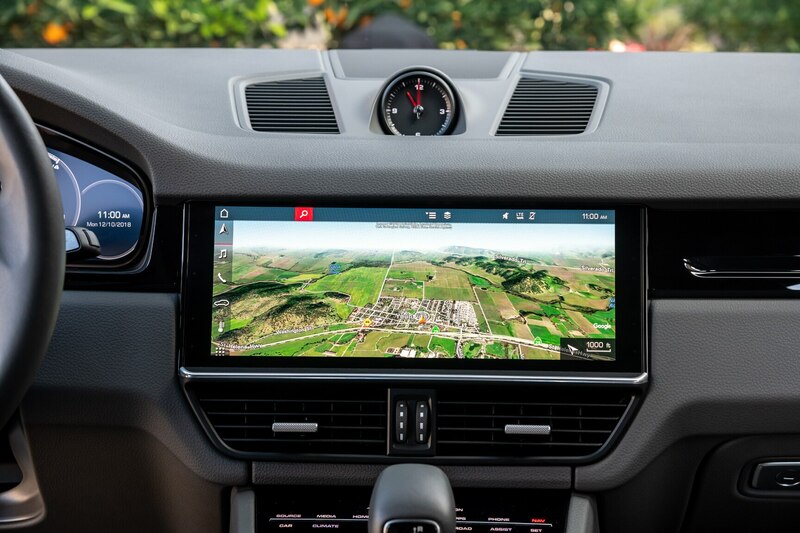 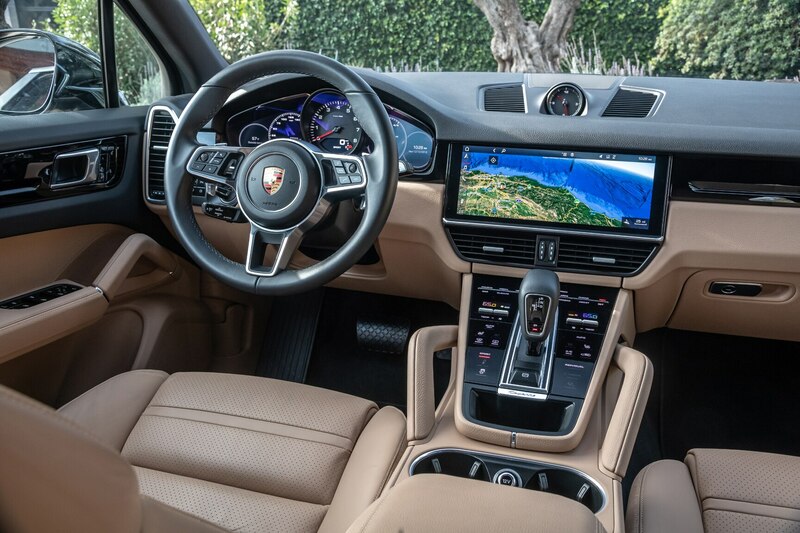 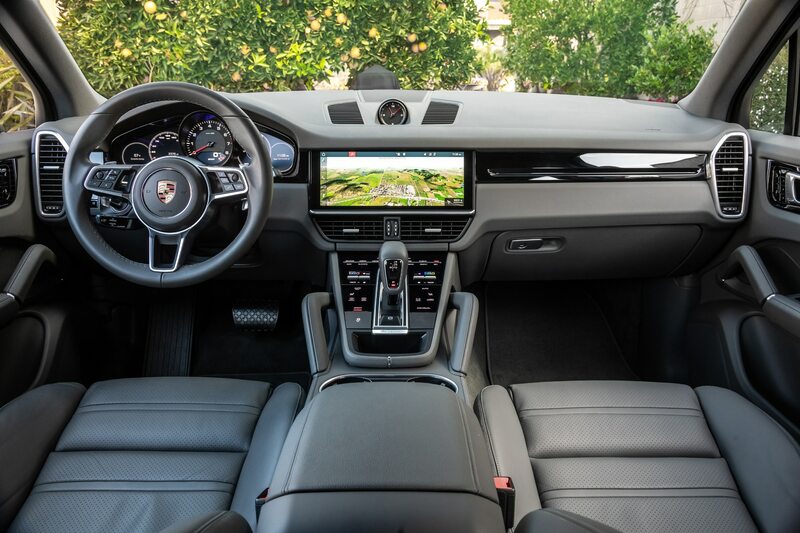 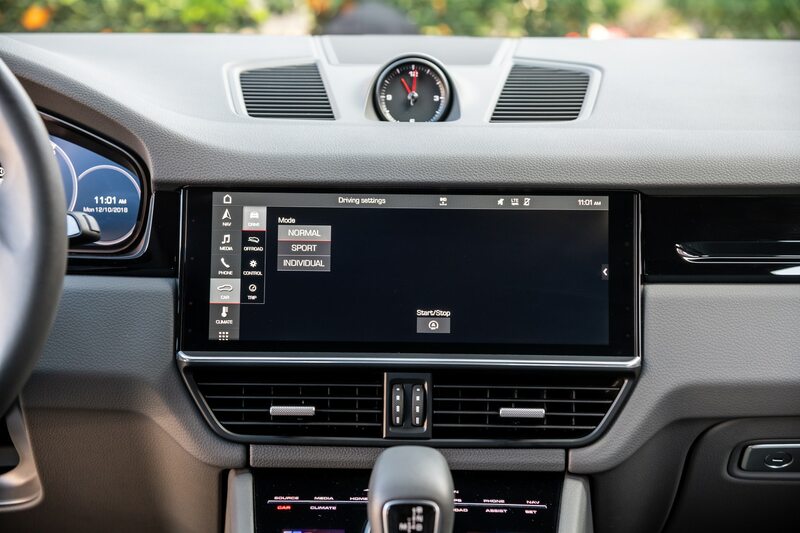 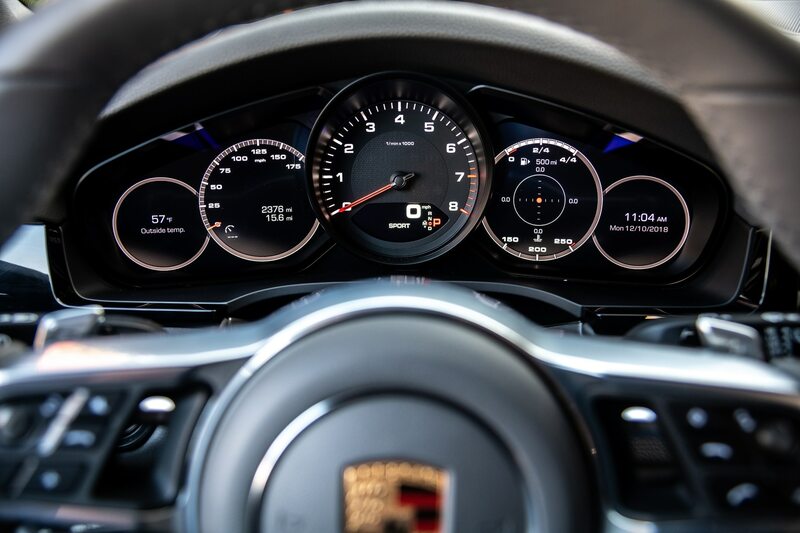 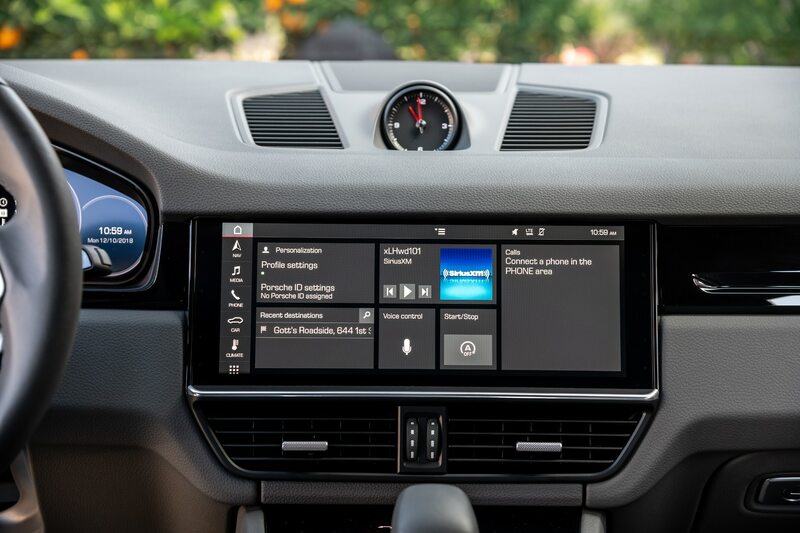 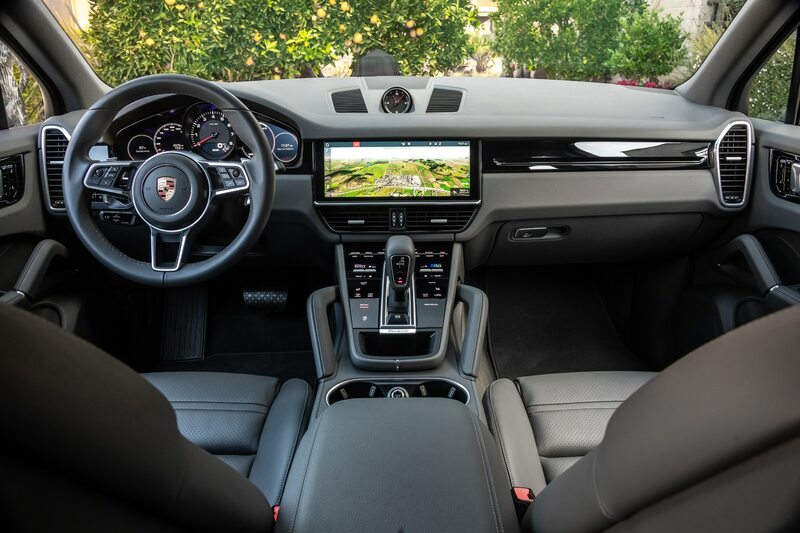 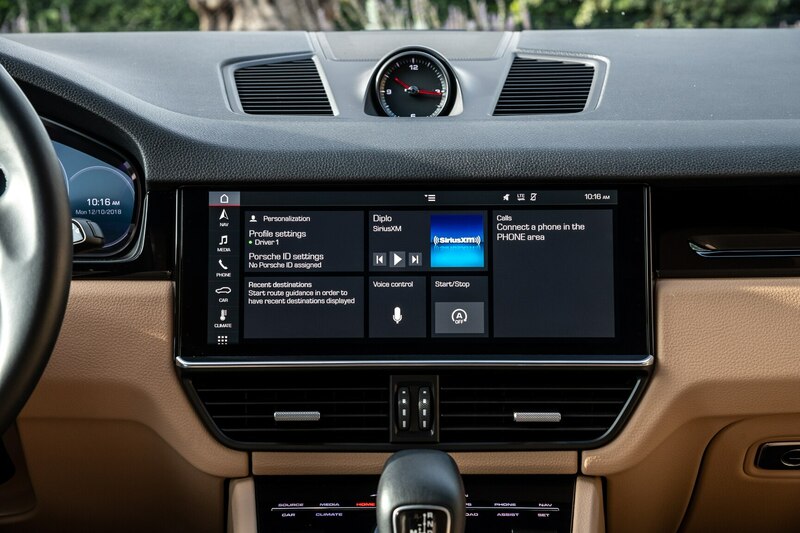 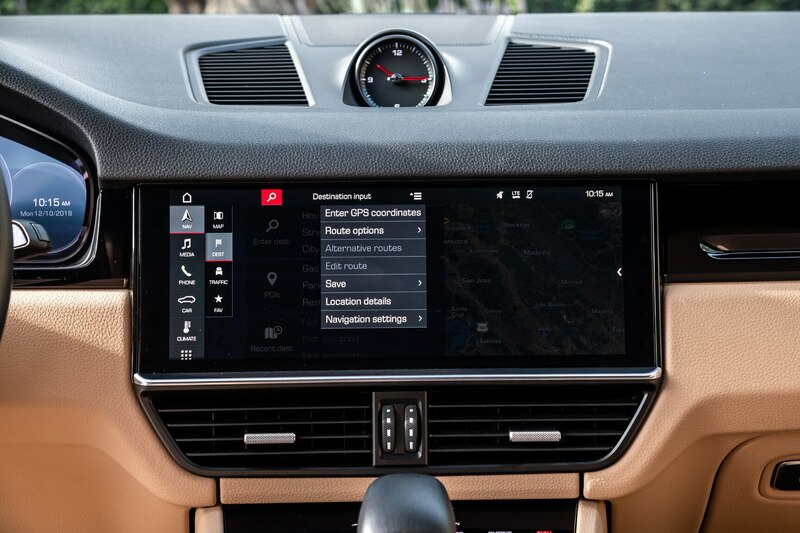 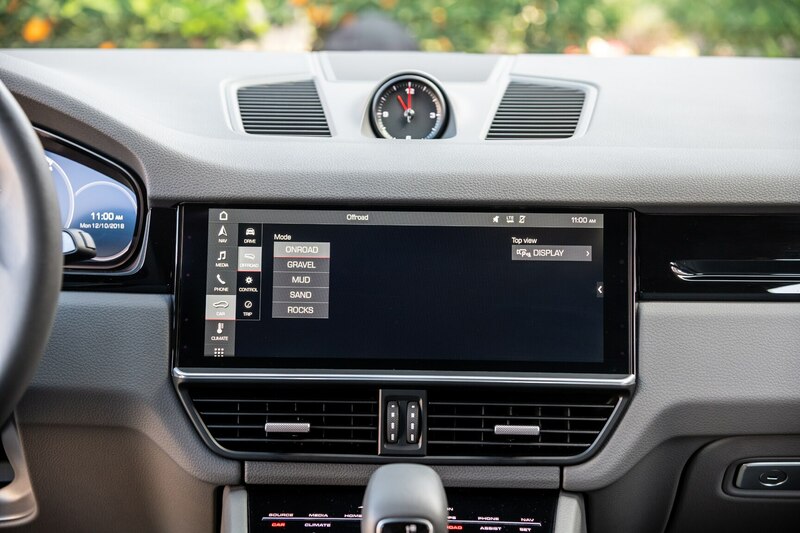 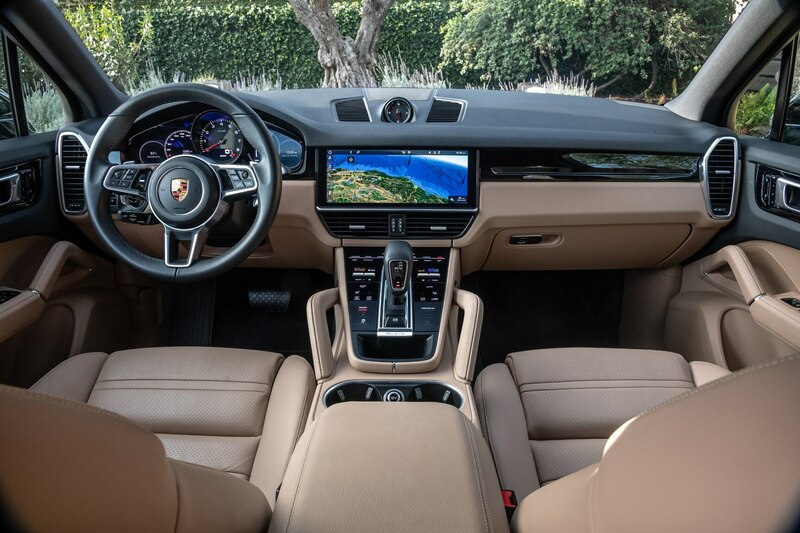 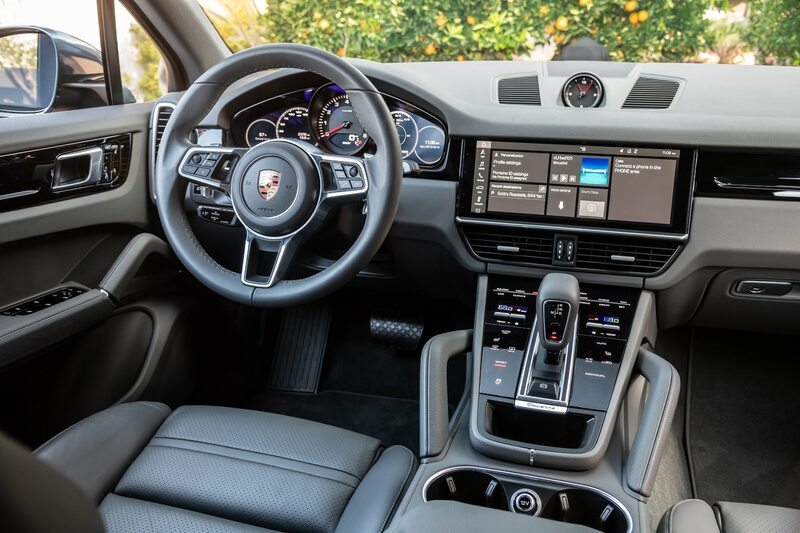 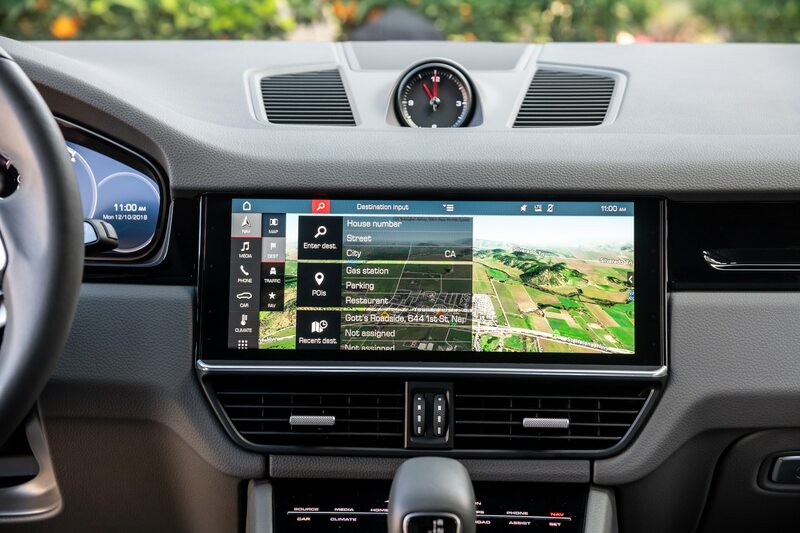 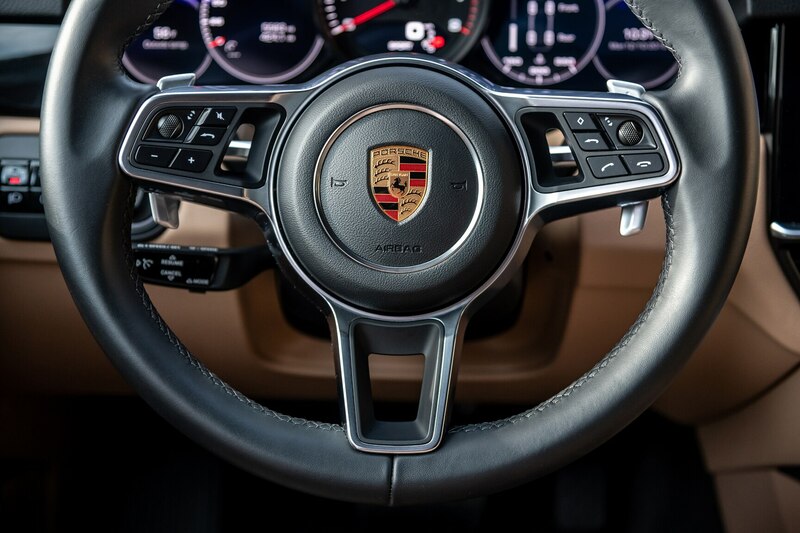 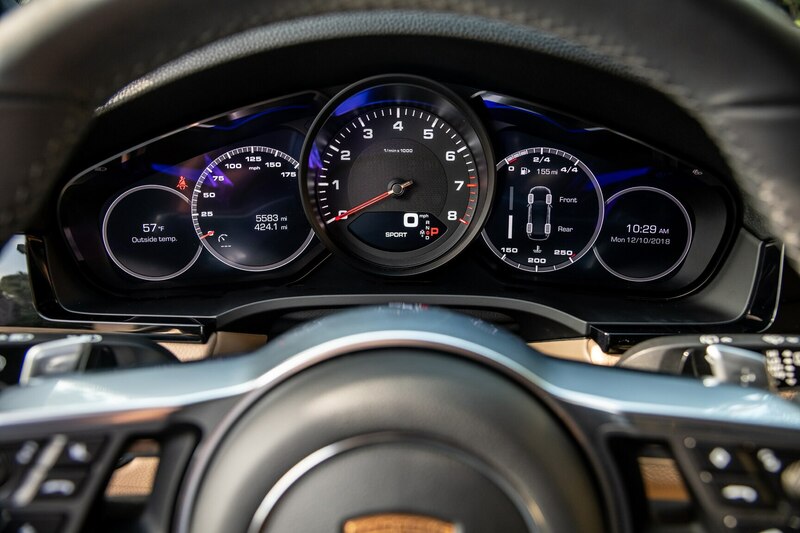 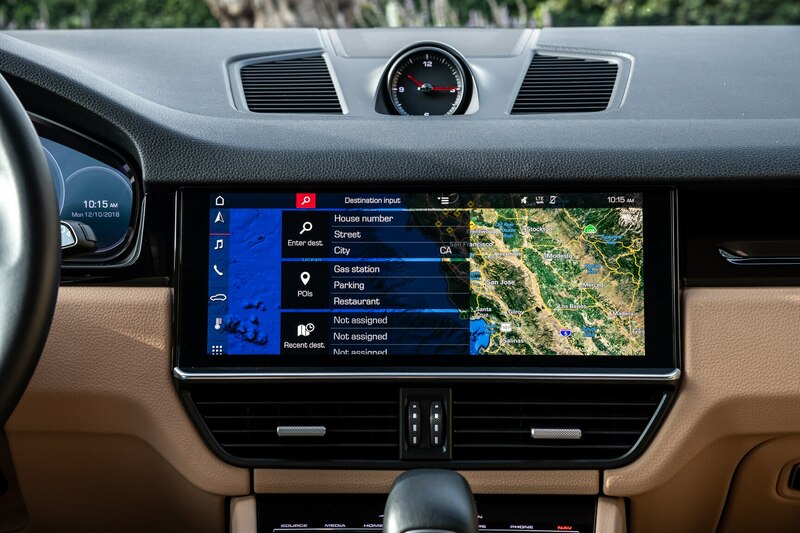 Inside, the Cayenne gets Porsche’s latest multimedia interface, a 12.3-inch proximity-sensor-equipped central touchscreen that is complemented by two seven-inch screens around the centrally positioned analog tachometer. 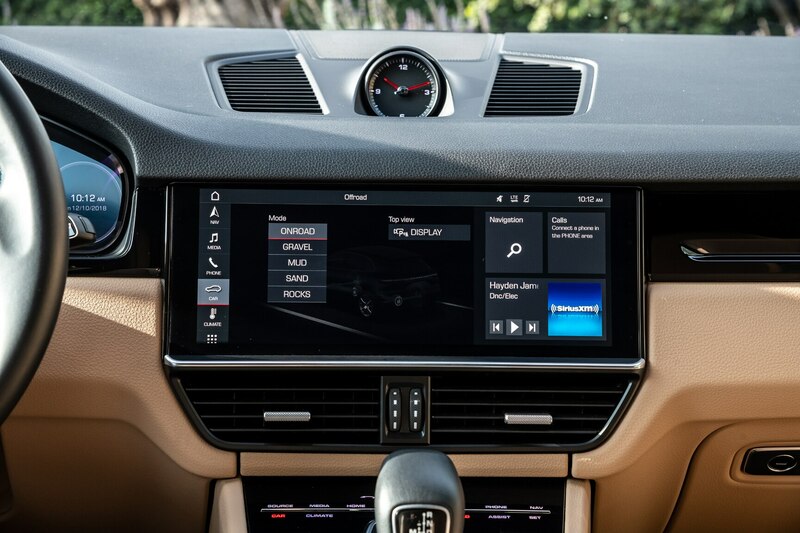 It offers a customizable menu that enables widget-style access to radio, navigation, and other items on the home page, and is easy to operate at first blush. 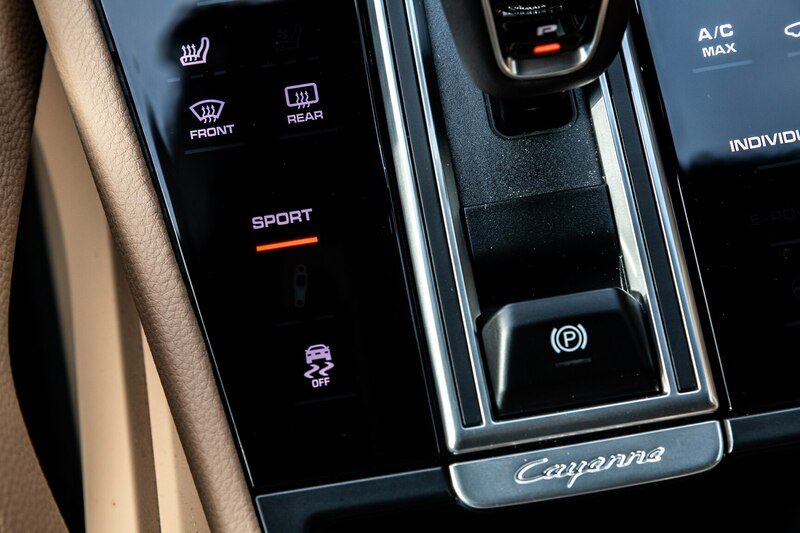 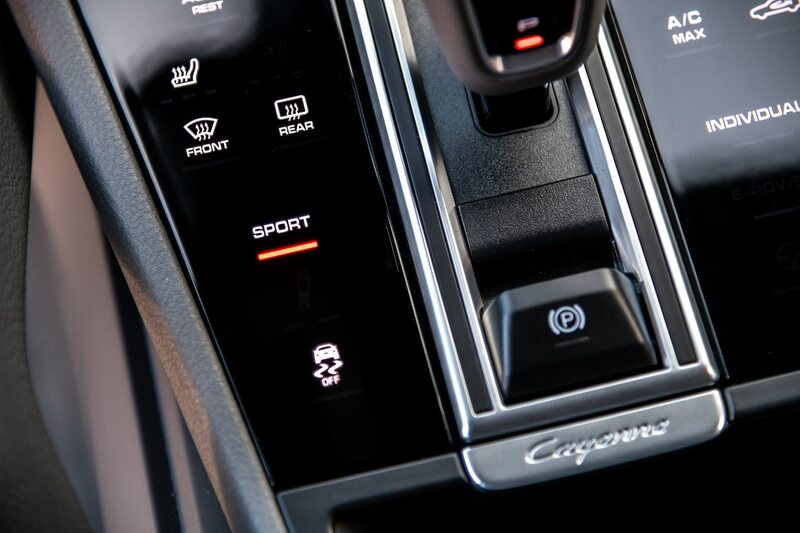 Yet while the look is clean, the system wants for an easily accessible control wheel or touchpad, and the flush, haptic “buttons” lack the tactile satisfaction of physical switchgear. 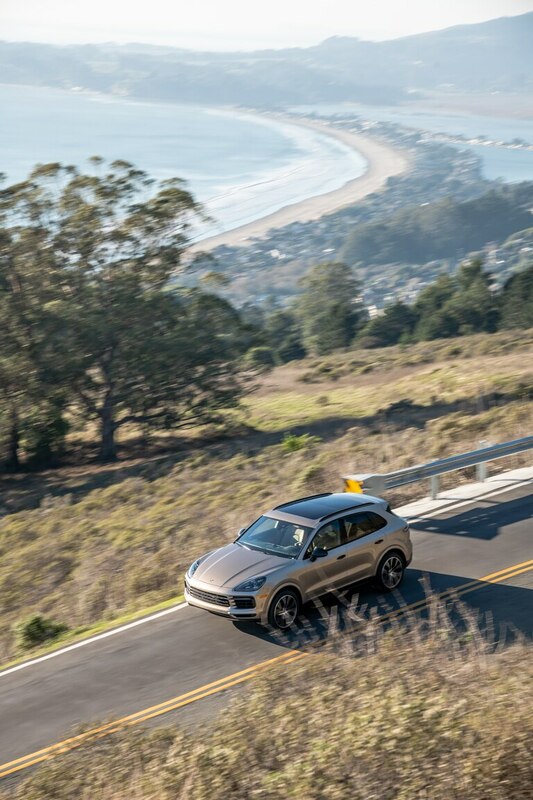 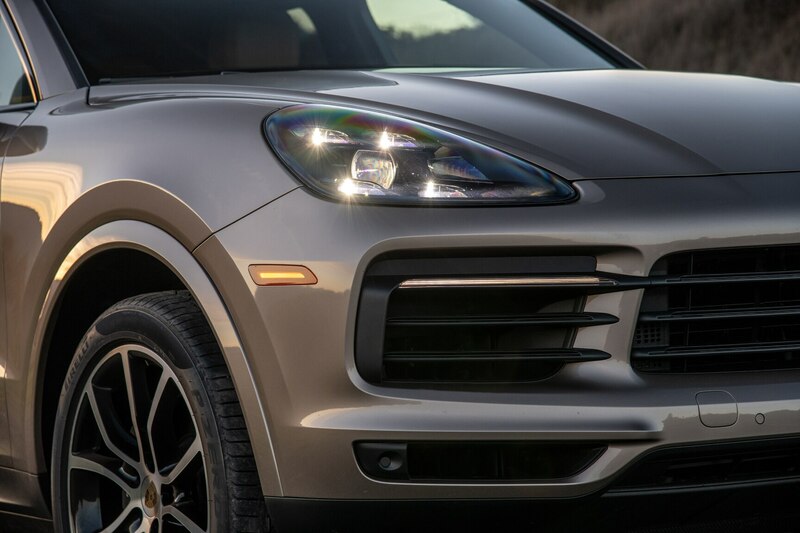 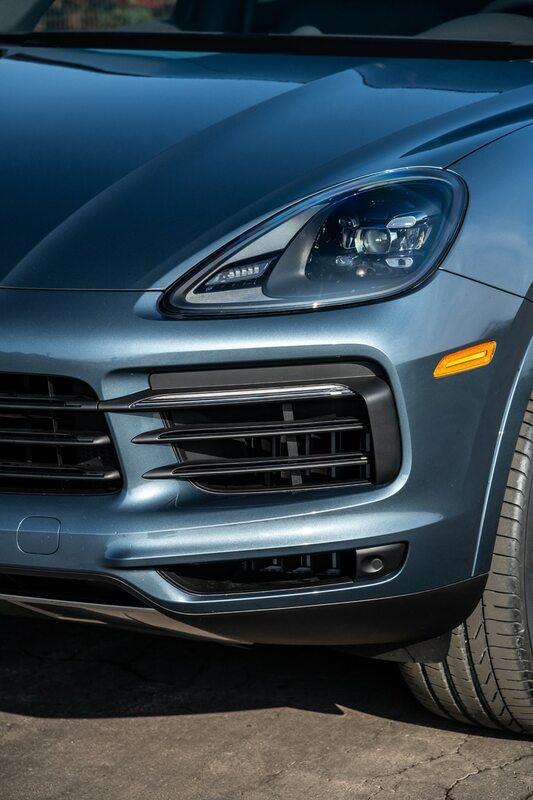 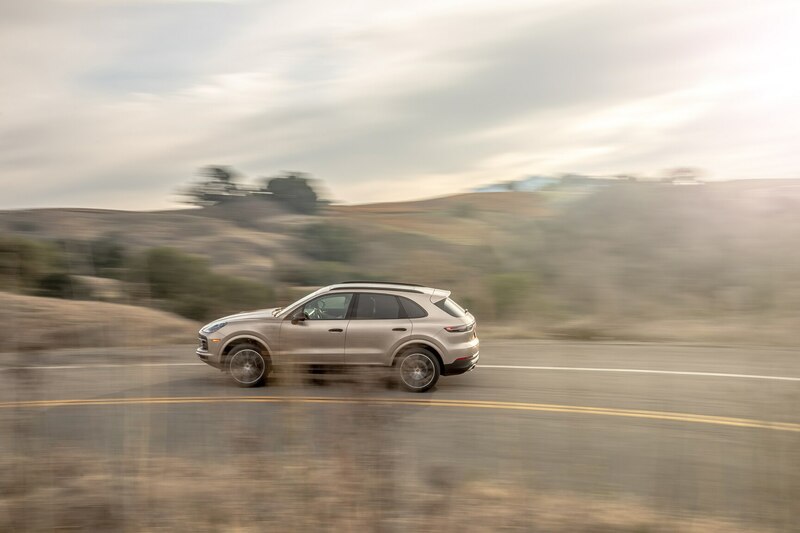 Thankfully, the new Cayenne is more gratifying to drive than its infotainment is to operate. 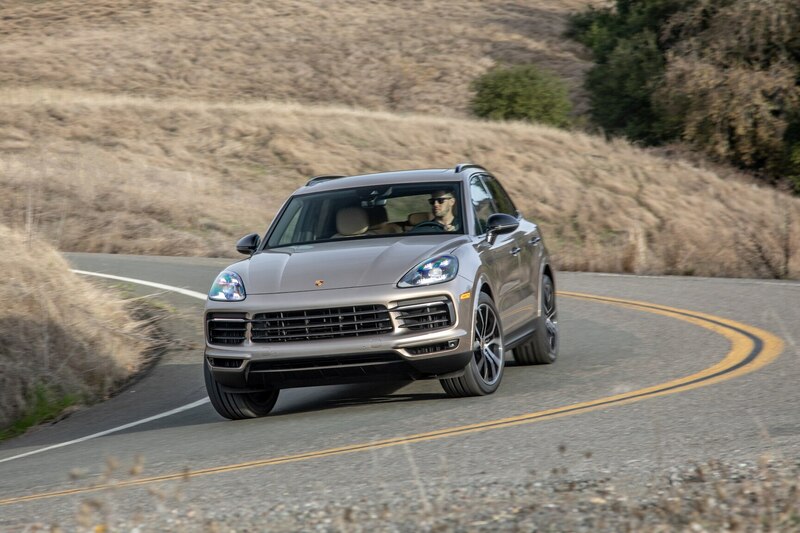 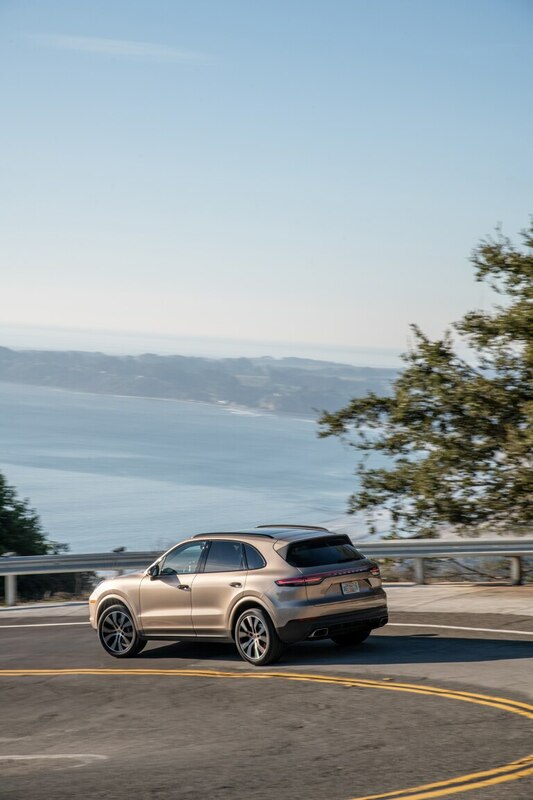 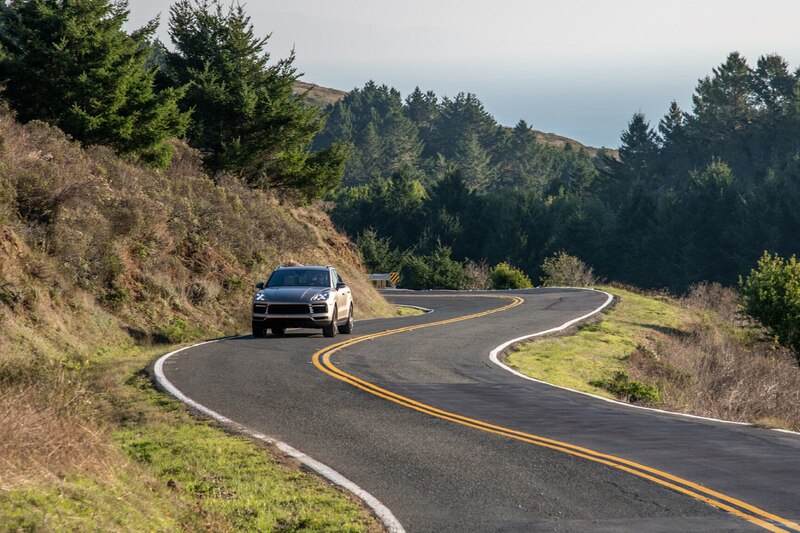 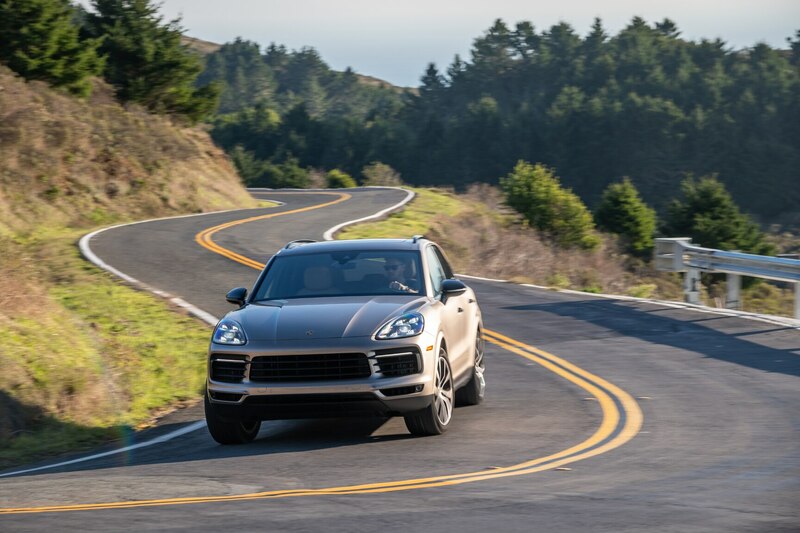 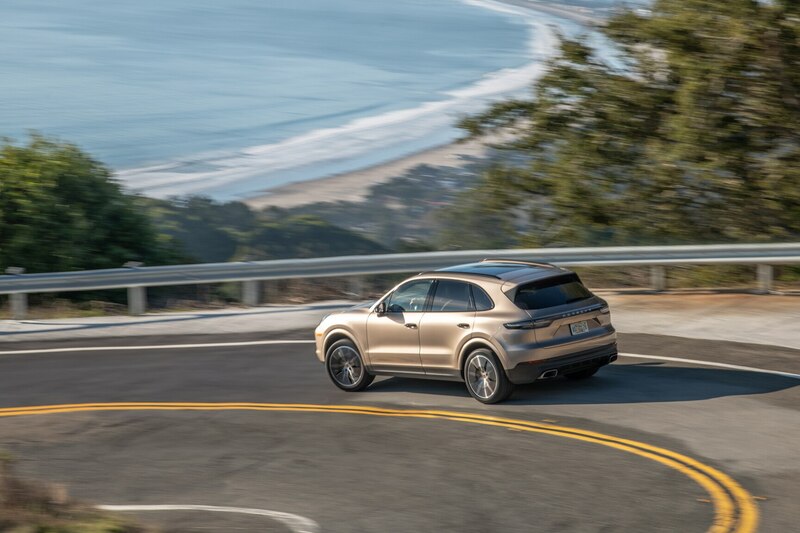 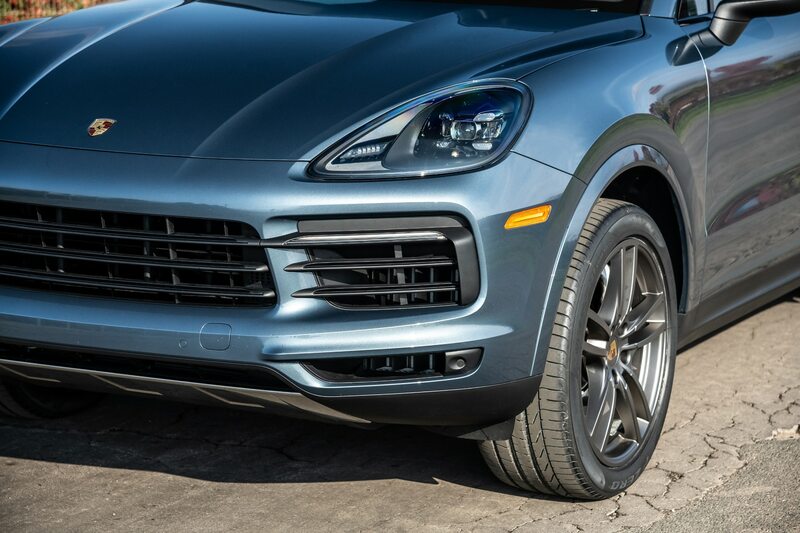 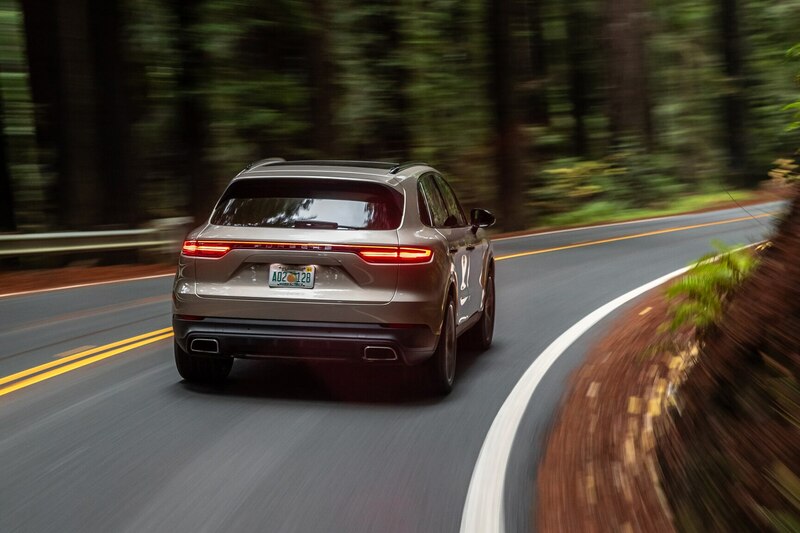 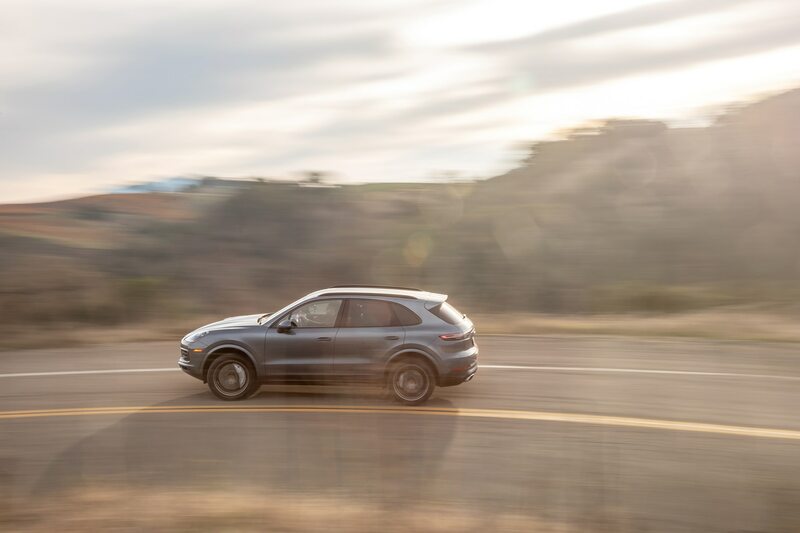 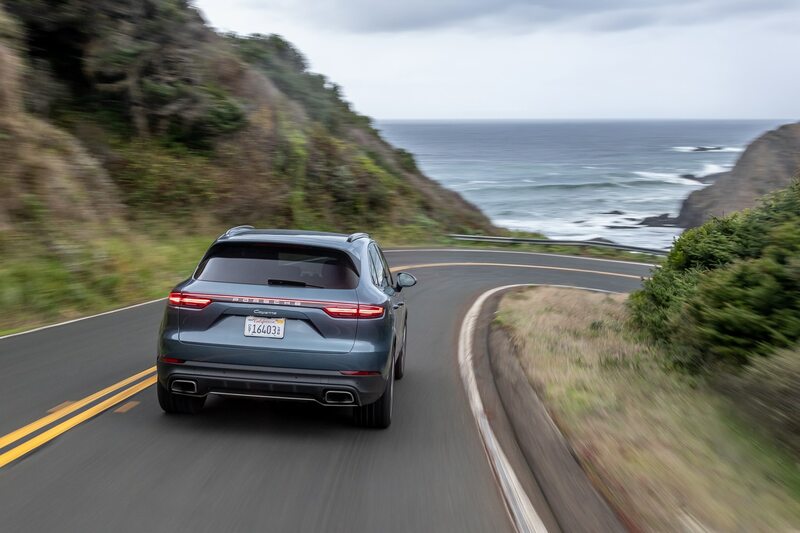 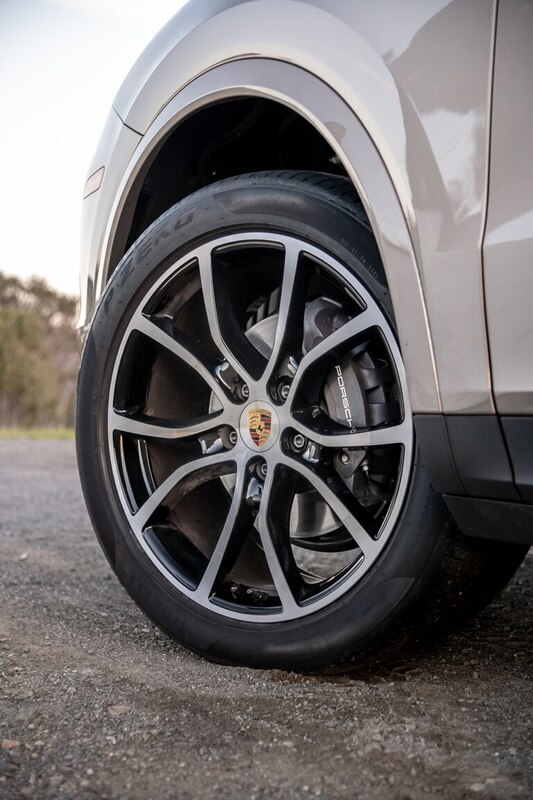 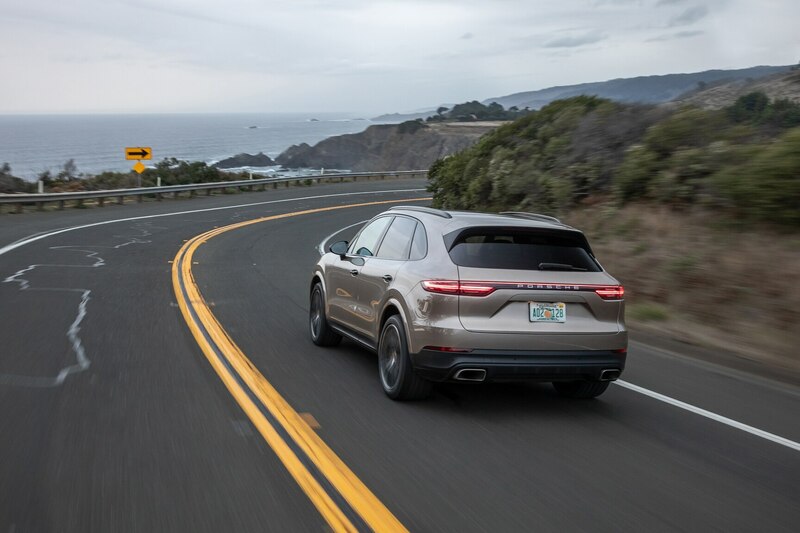 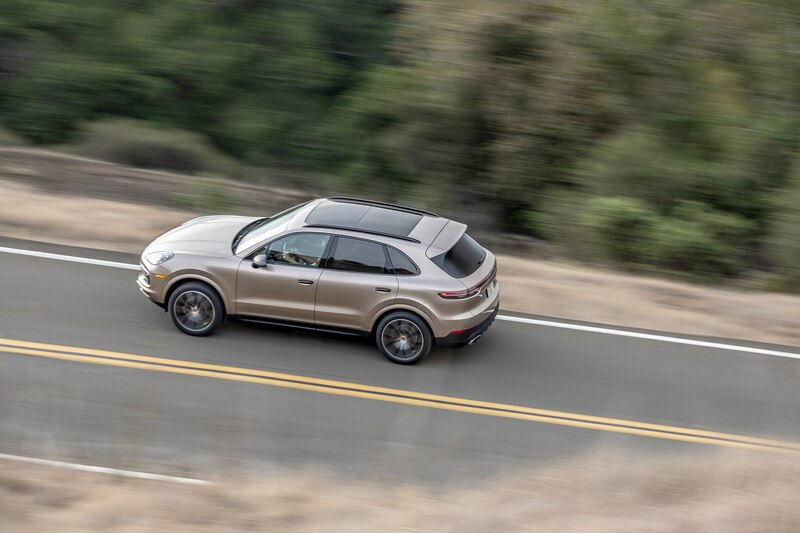 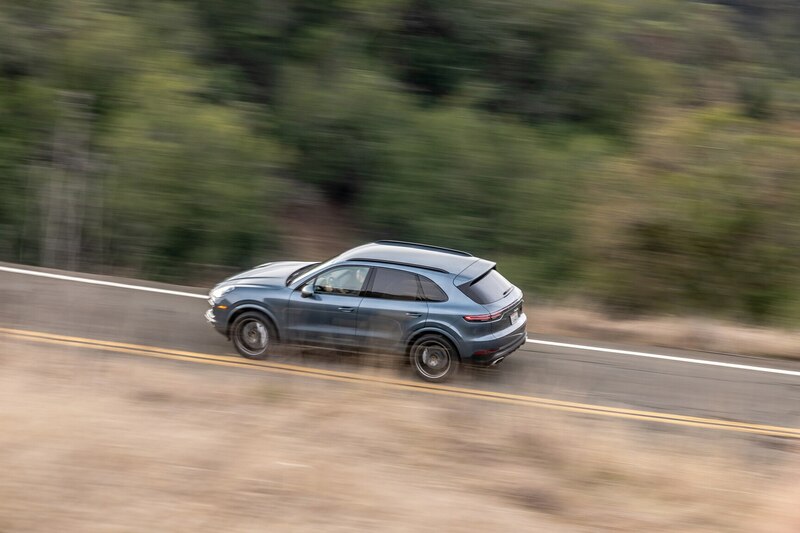 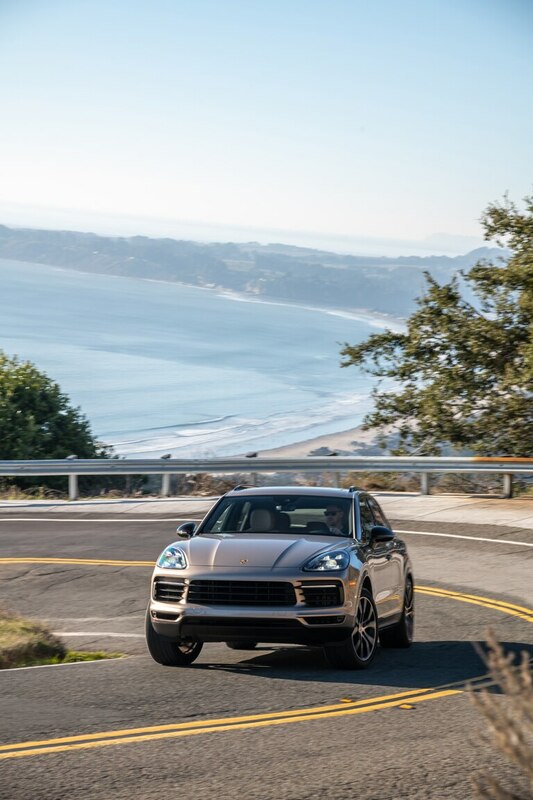 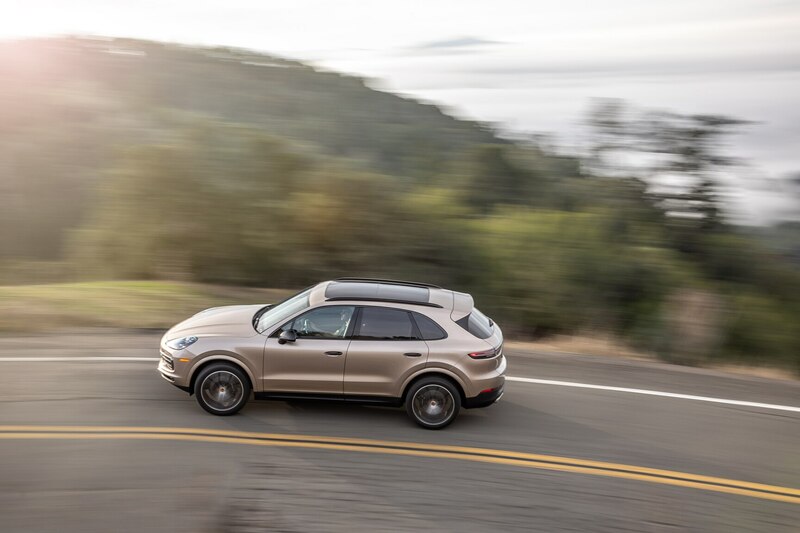 While the standard 19-inch wheel setup (up from last year’s 18-inchers) offers sharper maneuverability, the Pirelli P Zero–clad 21-inch option helps the Cayenne corner with an agility that belies its footprint. 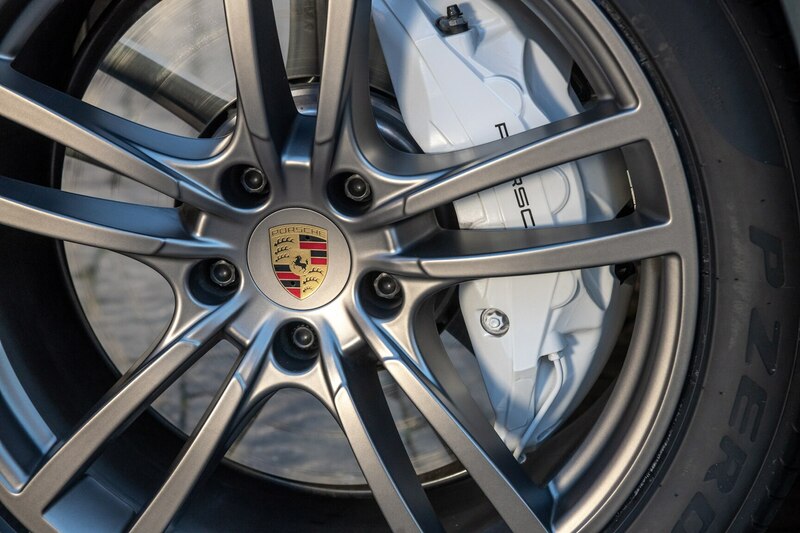 Also an added bonus: Porsche’s new optional PSCB surface-coated brakes, a $3,490 option not to be confused with the even pricier carbon-ceramic PCCBs. 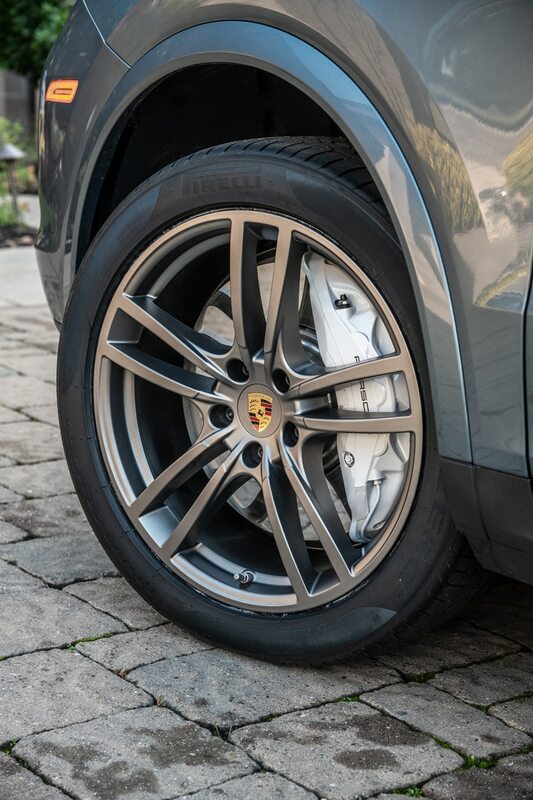 Using a massive, 16.3-inch surface area up front with a monster 10-piston caliper, the rotors are coated with a proprietary tungsten carbide material that creates an attractive mirrored surface, sure, but more importantly provides outstanding heat dissipation. 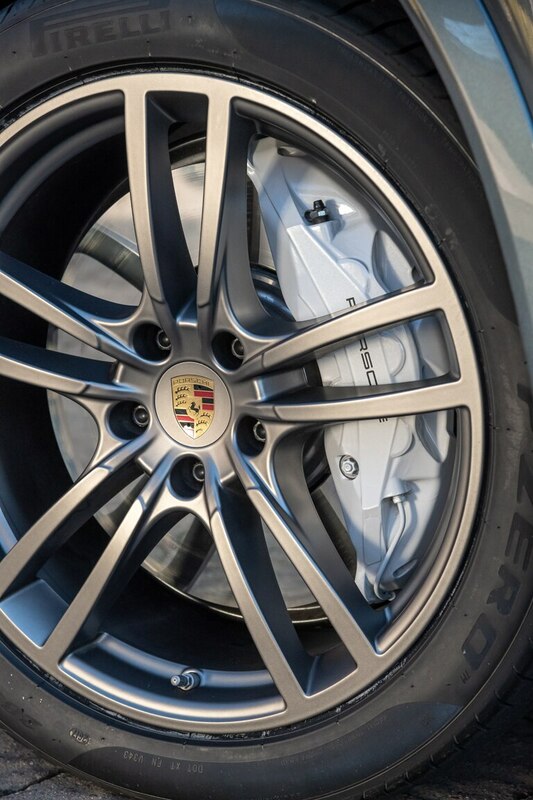 Beyond that, the PSCBs also deliver superior pedal feel while producing 90 percent less brake dust than standard stoppers. 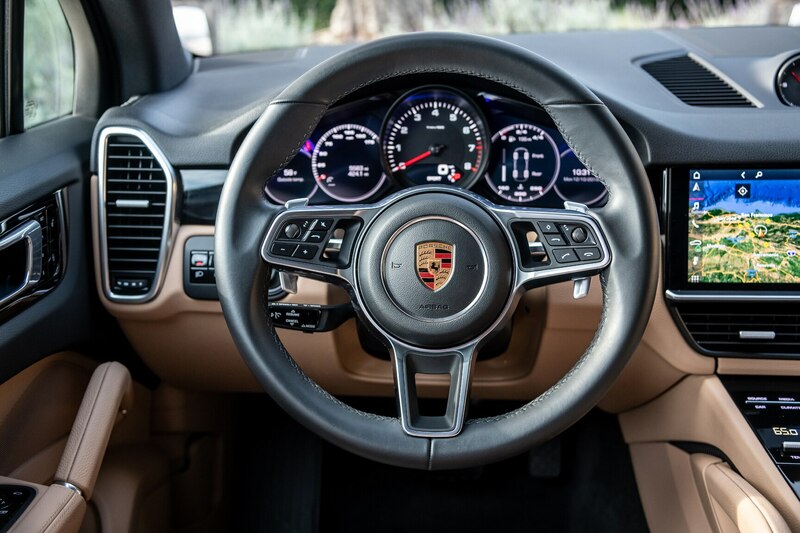 It takes some time to acclimate to the pedal sensitivity—at first, we decelerated with neck-snapping vigor—but we figure owners will get used to the short pedal travel and move on. 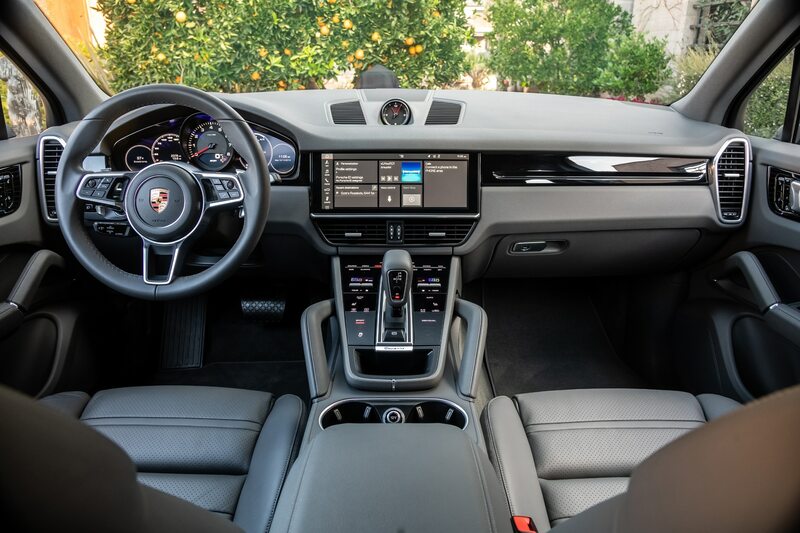 Regardless, the system works quite well and is highly likely to steal interest from the considerably more expensive carbon-ceramic option. 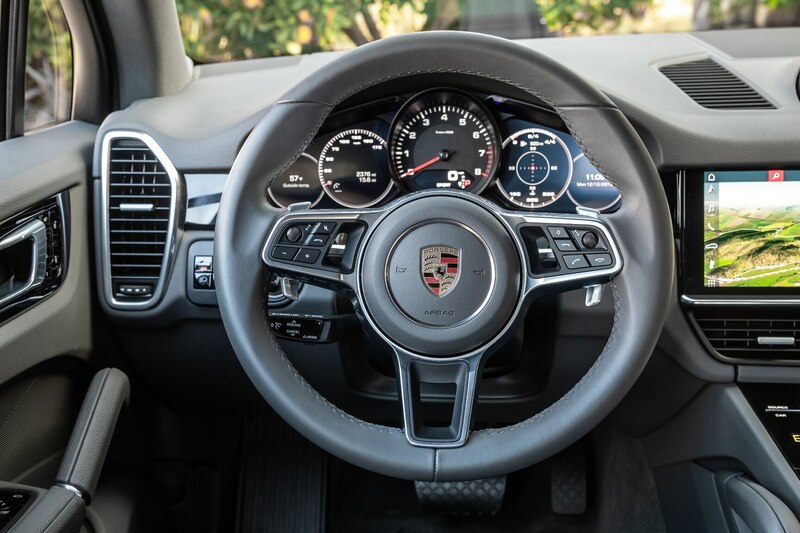 The ride is smooth and controlled over all surfaces with the adjustable suspension set to its softest or stiffest damping levels, while responsiveness would have presumably been even sharper with the new four-wheel steering, which unfortunately was not on any of our test cars. 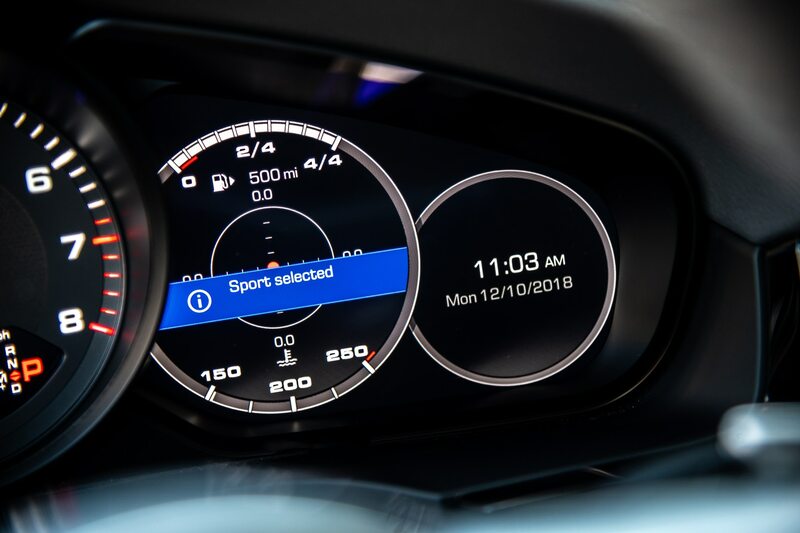 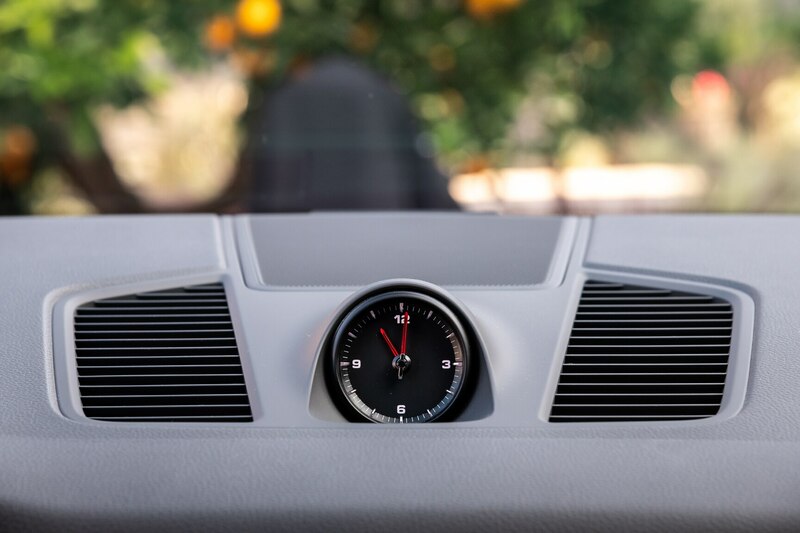 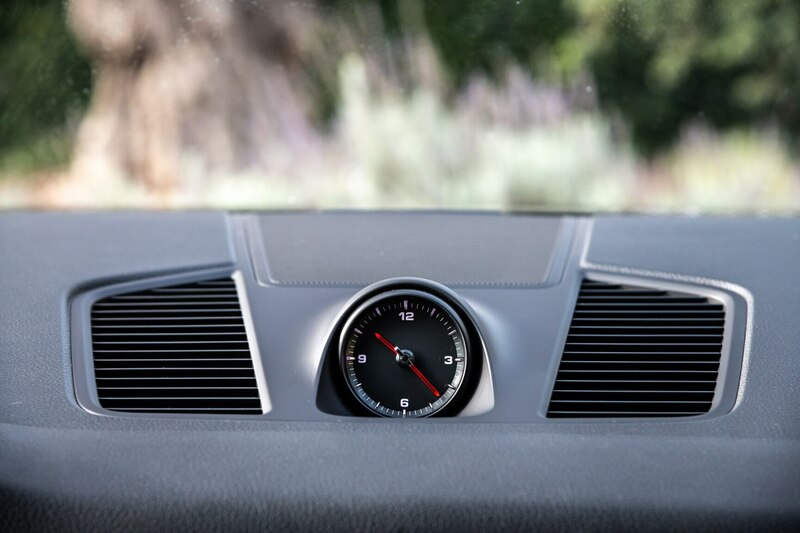 This system, which provides for up to three degrees of in-phase or counterphase steering, is essentially the same as found in the Audi Q7, where we’ve found it to be both effective and transparent in operation. 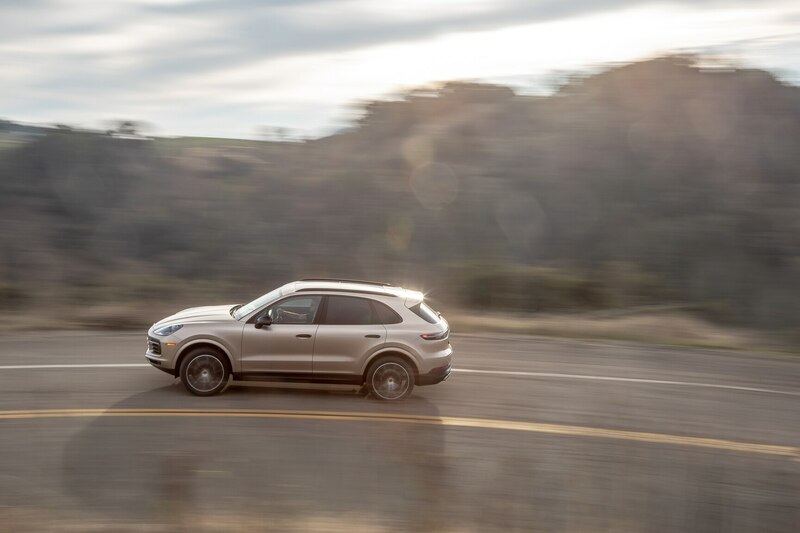 When considered as a whole, the entry-level Cayenne is a very satisfying vehicle to drive, with our only misgiving being its steep cost for those who want even a modicum of options. 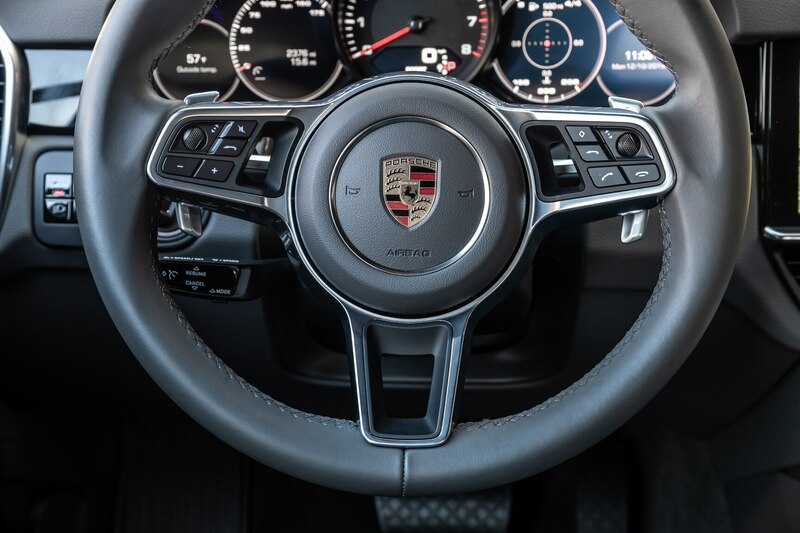 While the V-6 model starts at $66,750, the example we drove wore an $84,240 sticker despite its lack of many leather interior trimmings, uplevel audio, and the Sport Chrono package. 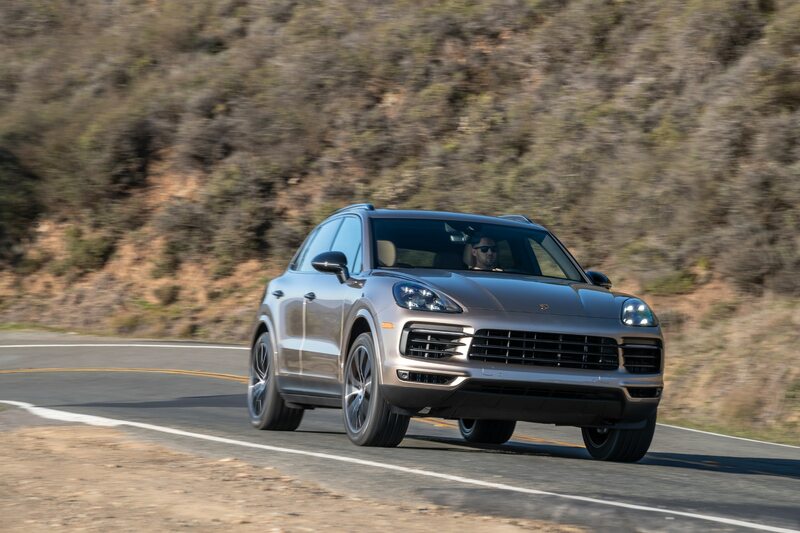 OF course, Porsche’s pricing tactics and long list of a la carte options underscore why it is one of the most profitable car companies in the world and why it is likely to remain so for the foreseeable future. 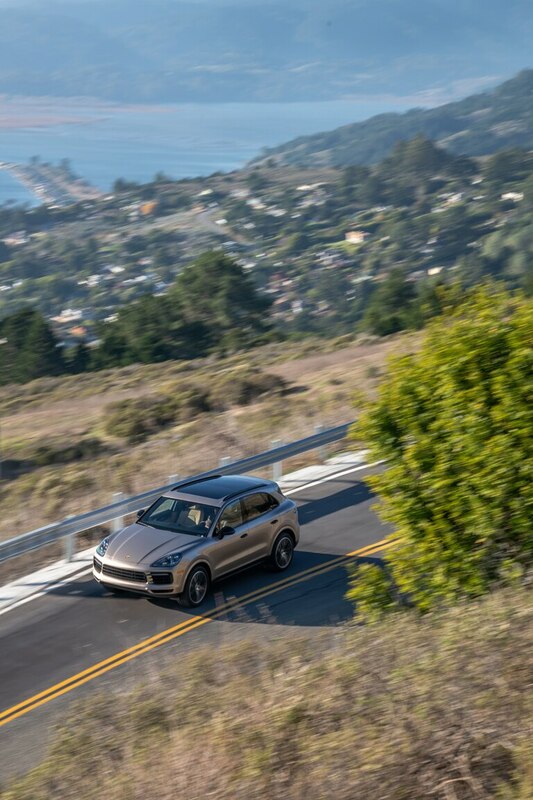 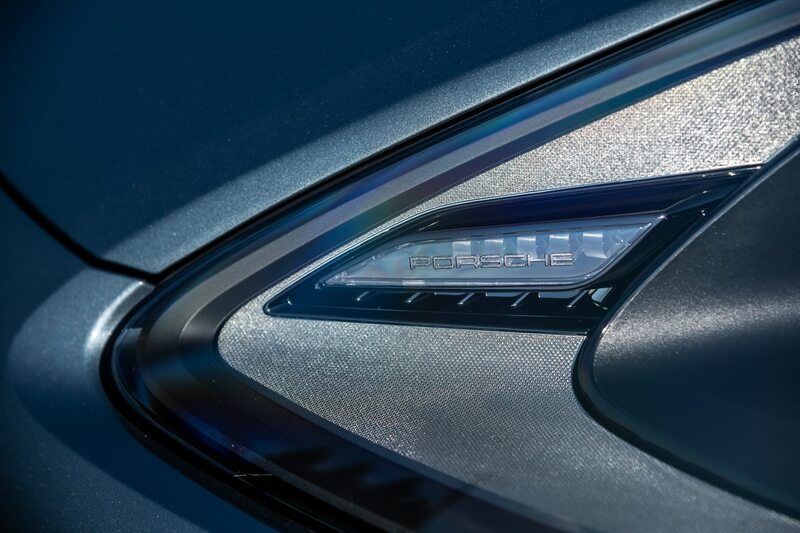 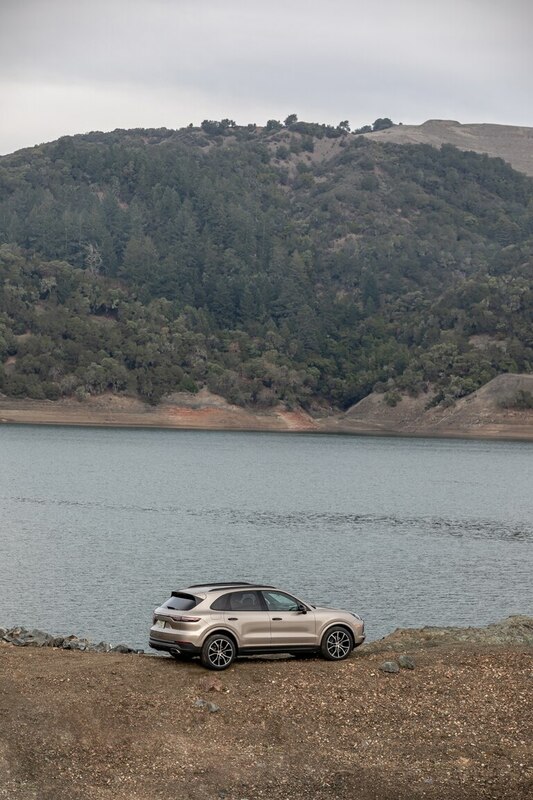 Of course, it helps when the products are very good at their core, and the new Cayenne is certainly that. 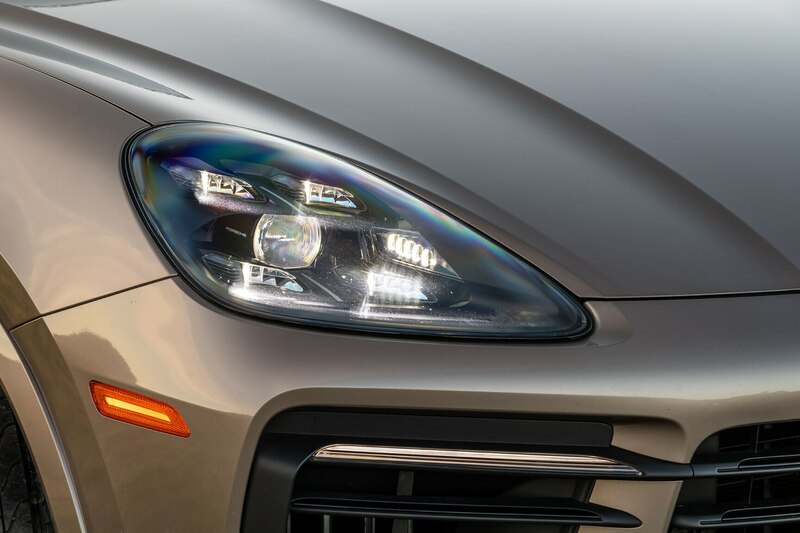 That it continues to fund development of amazing sports cars is at this point a cherry on top.